One mystery remains which my research has never fully solved. Why did the last two generations of our family have no knowledge of the original Thacher cabin? And why are there no photos or drawings of the cabin? Most importantly, why did the cabin disappear? Here is one surprising theory that could shed light on these questions. The Thacher and FitzPatrick families are proud of our Irish heritage thanks to the courage of our grandfather Kenelm R. Thacher (KRT) choosing to marry Catherine Callahan. Family lore is that this act labeled KRT as the black sheep of the family given the unfortunate bigotry toward Irish Catholics by blue blood Protestants in the late 19th and early 20th centuries. My Aunt Ellen spoke of certain Thacher family members crossing the street in downtown Albany, rather than conversing with her parents. It turns out that my grandfather was not the first Thacher to marry an Irish Catholic, nor was the resentment toward him the result of societal bigotry alone but rather a reflection of personal experiences. After the death of our great-grandfather George Hornell Thacher 2nd (GHT2), his properties (including Thacher Island at Blue Mountain Lake, his summer residence in Manchester, VT, the mansion in Albany, NY, and the family business) were divided among his five sons. 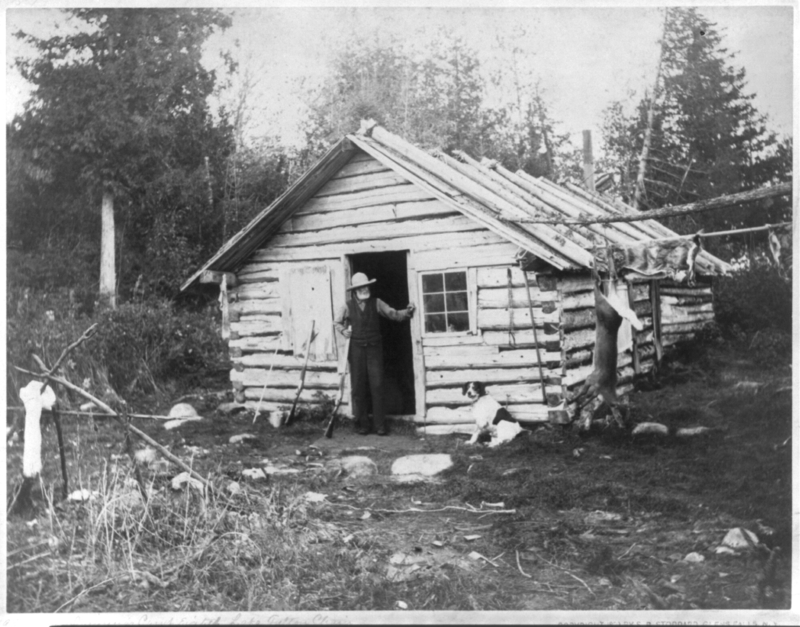 Our grandfather was given the least valuable undeveloped lands at Raquette Lake with its one room cabin and lean-to. We have often believed that our present day enjoyment of the beauty of Indian Point is the result of this bigotry. Given this family lore, it was most surprising when my research discovered three facts completely contrary to a perceived bias against Irish Catholics. Reverend Henry Gabriels, President of St. Josephs’ Catholic Seminary in Troy, NY served Catholic mass at the Thacher Camp on Indian Point on July 11-14 in 1878. 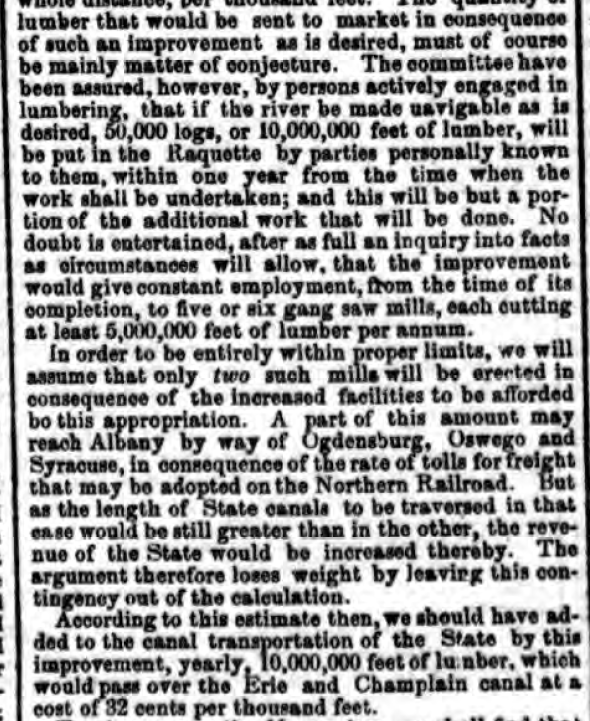 Mayor George Hornell Thacher Sr. (GHT1) secretly donated $100 dollars (about $3,000 today) each year for the construction of a new St. Mary’s Catholic Cathedral in Albany from 1866 to 1869. In July 1887, after GHT’s death in February, Mrs. George Hornell Thacher hosted Reverend Henry Gabriels at Thacher Island in Blue Mountain. Why would GHT1 have a strong personal connection to Reverend Henry Gabriels and so generously support the construction of St. Mary’s? 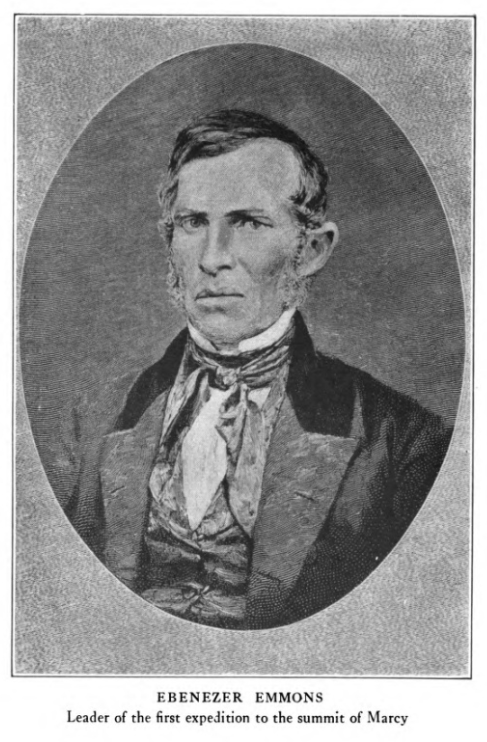 GHT1 had attended the Princeton Seminary and served as a Presbyterian Minister from 1843 to 1847. Hardly a non-religious man, he was even less likely to find friendship with a Catholic. 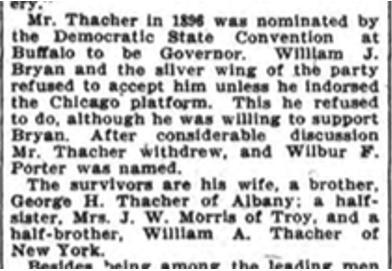 Our family never knew about and none of the official biographies of the Thacher family in Albany ever mentioned half-siblings. However, this gave me another epiphany. Ursula Jane Boyd Thacher, mother of JHT1 and GHT2, died in 1874. Clearly, the Mrs. George Hornell Thacher who hosted Rev. Gabriels in 1887 was GHT1’s second wife (incidentally also omitted from all official biographies). 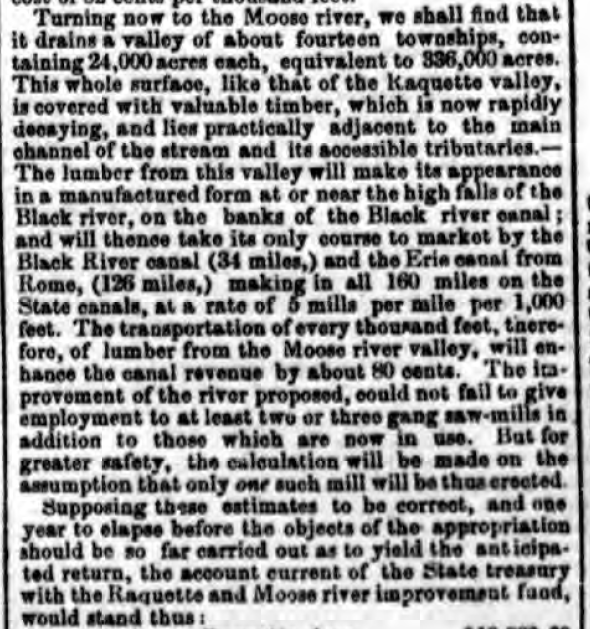 Using the names of William A. Thacher and Mrs. J. W. Morris, I began searching for more information and came upon this startling information. So GHT1 had remarried after his first wife’s death and started a second family with an Irish Catholic woman. Who was this Elizabeth Thacher from Ireland? What was her maiden name? The first clue came from an in memoriam to Mrs. J. W. Morris’ late husband which identified his wife as Mary Agnes Thacher. GHT1’s daughter’s name led to a reference in the St. Peter’s Catholic Church of Troy’s online listing of church donations and gifts. Dr. J.W. 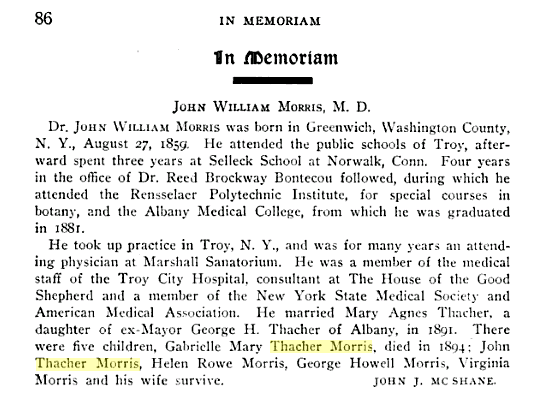 Morris and Mrs. J. W. Morris had donated a church bell chime in memory of their daughter Gabrielle Mary Thacher Morris. In the same online listing, an “Eliza Thacher” had donated a stained glass window in memory of her father Matthew Toomey. Based on the hunch that Elizabeth Thacher was originally Eliza Toomey, I pursued that name. As the 1860 US Census shows, Eliza Toomey, age 24, was a servant in George Hornell Thacher Sr.’s home in 1860. So did GHT1 fall in love and marry Eliza Toomey after his first wife’s death? No, not as simple as that. Mary Agnes was born in 1866, a full eight years before Ursula Jane Boyd’s death in 1874. William was born in 1868. 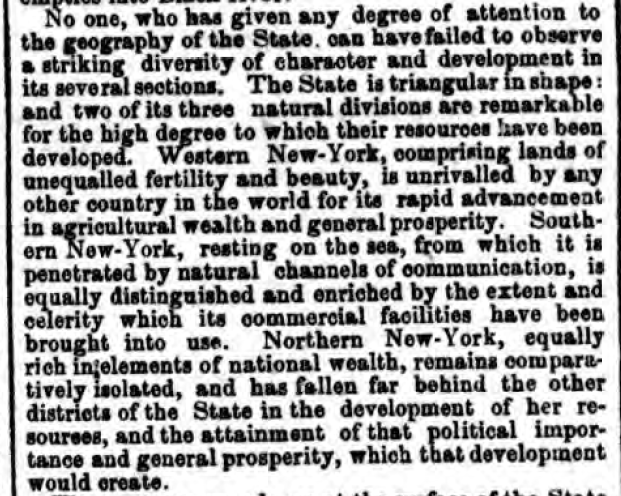 It appears that Eliza moved away to birth the children out of the prying eyes of Albany society. Mary Agnes supposedly was born in Pittsfield, MA and William in nearby Canaan, NY. I have not yet found birth certificates nor baptismal papers for the children, nor a marriage certificate for GHT1 and Eliza. My suspicion is that the Rev. Henry Gabriels played a role in both aspects. While I have no proof, the strong, decades long personal friendship between Gabriels and Eliza Thacher leads me to believe that he secretly married the two sometime after GHT1’s first wife died. I find the timing of GHT1’s secret donations to the construction of St. Mary’s Catholic Cathedral an interesting coincidence. 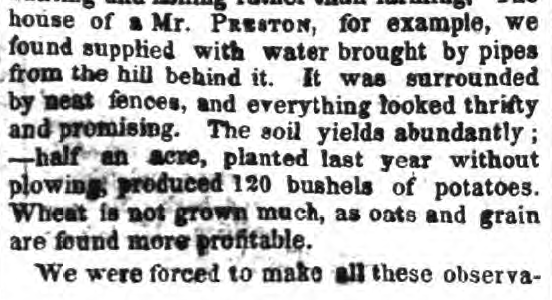 Might that have been compensation for private, off-the-record baptisms for the children in 1866 and 1868? Even after GHT1’s death, Eliza continued to be a generous patron of the Catholic Church, such that her funeral was attended by several bishops and officials from different dioceses from across the State. Conjecture to be sure, but is it surprising that the Rev. Gabriels, possessing knowledge of a damning personal secret of one of the wealthiest political families in New York State, became the Bishop of Ogdensburg in 1892? It appears that GHT1 continued his affair for over a decade. While we do not know exactly when they married, it must have been after his first wife’s death in 1874. 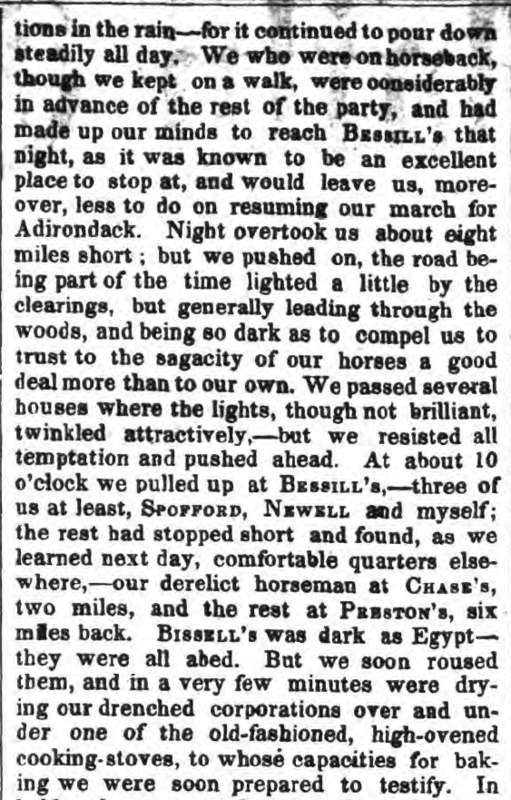 We do know that the 1875 NYS Census shows GHT1 maintaining two households, one on Washington Avenue in Albany accompanied by his late wife’s sister, and one at 65 Grand Division Street in Troy where he resided with Eliza and the children. Although they appear in the census, I believe GHT1 was attempting to keep this second family a secret from the Albany society. Nothing was published in the press actually naming Elizabeth Thacher nor identifying the children as being the son and daughter of GHT1 until after his death in 1887. GHT1’s last will and testament makes no mention of nor bequeaths anything to Eliza or the children. In addition, his sons John Boyd and George Hornell, Jr., prepared a legal document by which Eliza signed away any rights she had to her late husband’s estate. A cruel act, I thought, until I learned that prior to his death GHT1 had provided for Eliza and the children’s future by giving her a sizable fortune in railroad company stock. It is unknown how much of the family wealth went to Eliza, but it could easily explain the apparent resentment that George Hornell Jr. displayed toward the second family and his future disdain for his son’s (my grandfather’s) wife Catherine Callahan. Which brings us back to the Adirondacks. According to the History of Hamilton County, John Boyd Thacher “built a cabin for the use of his father,” in 1867 on Thacher Island on Blue Mountain Lake. An interesting choice of words by the authors Aber and King? Could it be that the island was purchased specifically for GHT1 to have a place to spend time with his secret second family, one year after Mary Agnes’ birth? 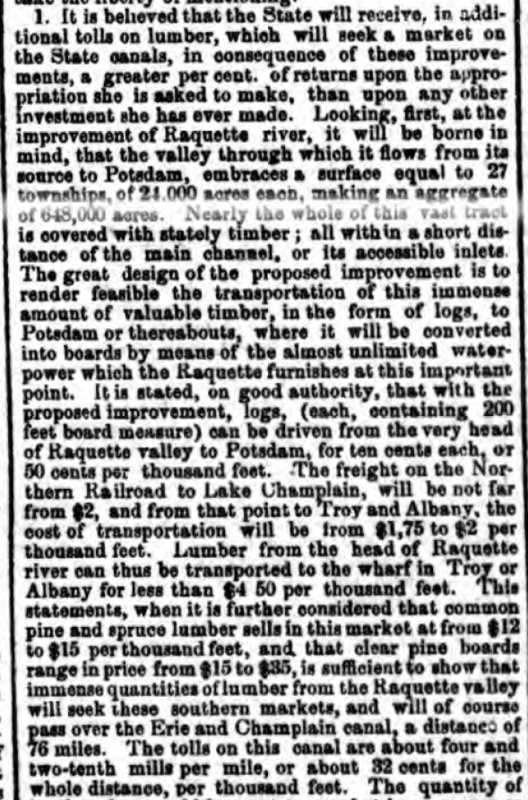 Although the deed to Thacher Island is in John Boyd Thacher’s name, there is little evidence of his using the lodge there until after 1876, when he also purchased Indian Point on Raquette Lake. John Boyd appears to be the owner of Indian Point in name only. I have not found any evidence that he ever spent time there. Conversely, the evidence shows that his father, Eliza, Mary Agnes and William regularly stayed at the Thacher Camp on Indian Point. 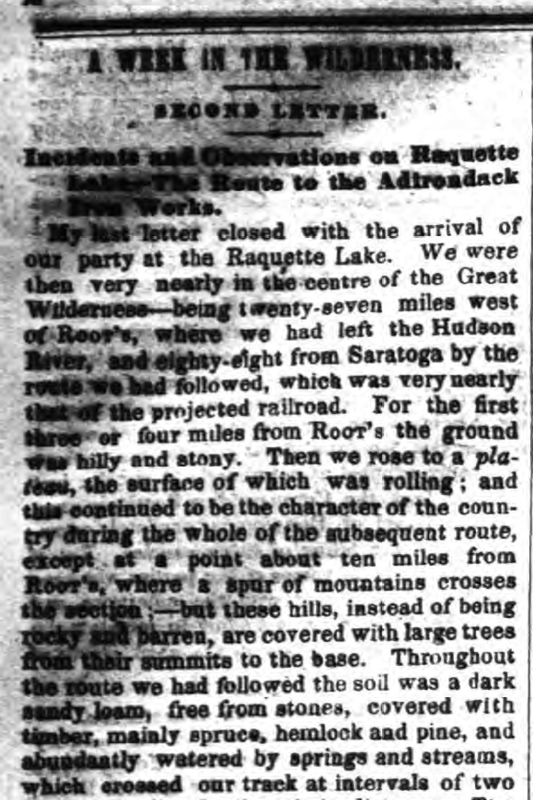 According to the historian Larry Miller, it was common for the camp owners on Raquette to end their long day of travel by train, stage coach and steamer at Ike Kenwell’s Raquette Lake House on Tioga Point for the night and then move to their private camps the next morning. Entries for GHT1 and his second family appear at least two times in Ike Kenwell’s guest registry, July 8, 1882 is shown below. We also have letters written by GHT1 to his son George Jr. from the Thacher Camp on Indian Point referencing the children’s nicknames Willie and Mamie. I believe that GHT1’s move from Blue Mt. 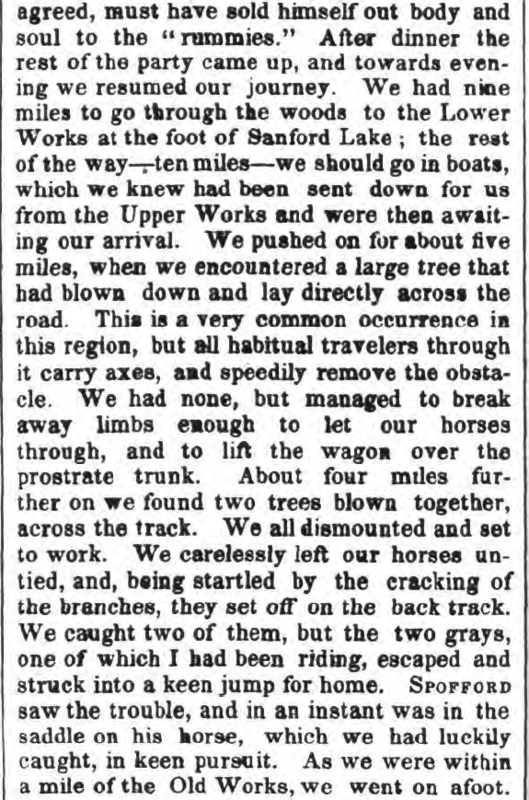 Lake to Raquette Lake in 1876 may indicate that was the year that he revealed his second family to his sons. 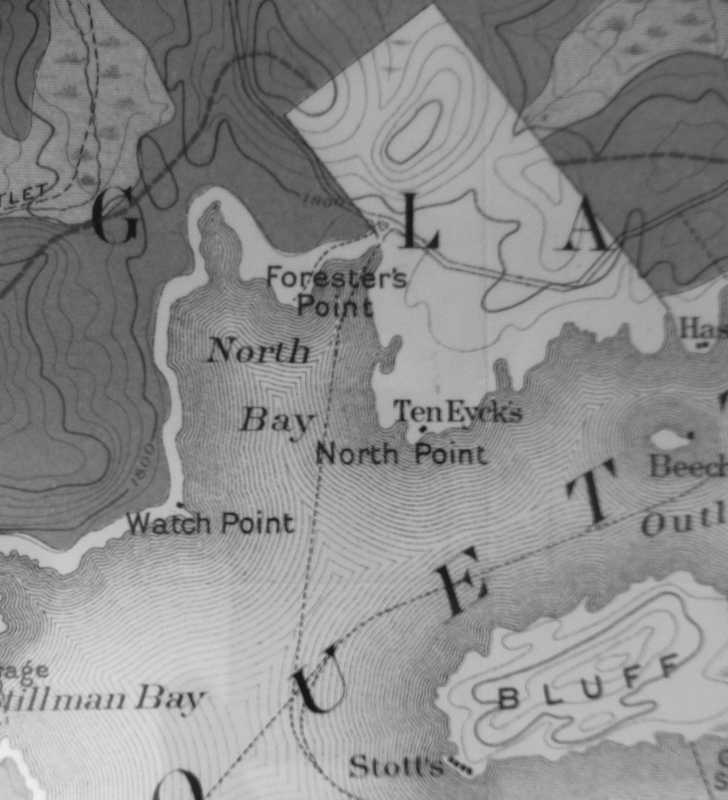 Perhaps the sons’ less than charitable response required GHT1 to build a new cabin at Raquette while John Boyd and George Jr. continued to use Thacher Island on Blue Mt. Lake. While he may have come out to his sons, I believe GHT1 still wanted Albany society to be in the dark about his new family. This could explain why the land on Indian Point was put in John Boyd’s name. 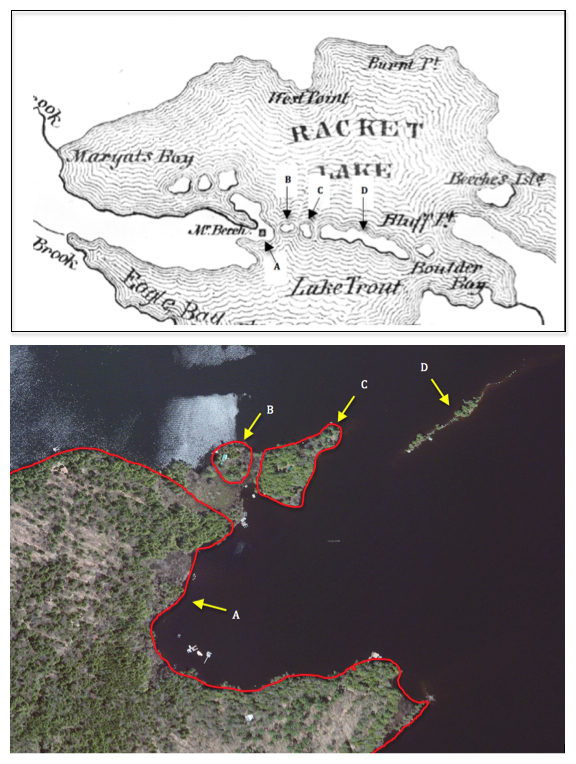 While most of the other private camps on Raquette Lake at the time appeared on maps and in the photos of Seneca Ray Stoddard, the Thacher Camp was notably absent. The property on Indian Point appears to have been abandoned between 1886 and 1910, and the original Thacher Camp cabin disappeared without a trace. At the time of their father’s death in 1887, John Boyd established a summer residence in Altamont, NY and George Jr. began to summer in Manchester, Vt. 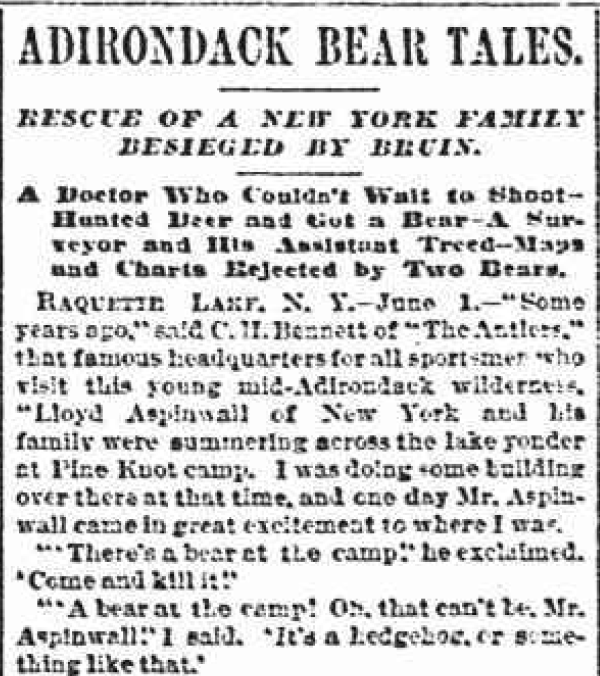 I suspect that they associated the Adirondack camps with Eliza and her family. We may never know the truth but fortunately, all trace of the second family was not lost. Last summer I hosted Nancy Morris Tuthill, the great-great-granddaughter of George and Eliza, at our cabin on Indian Point. 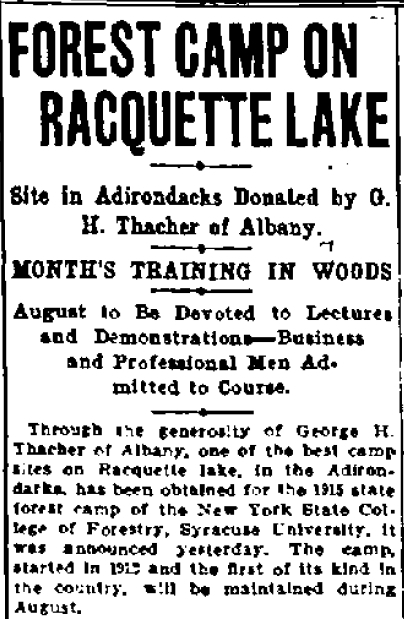 It is fitting that this descendent of Eliza, who brought the Thachers to the Adirondacks, is a resident of Lake Placid. While I feel that our story has come full circle and our history on Indian Point is now understood, I will forever be searching for just one photo of the original Thacher Camp on Indian Point. 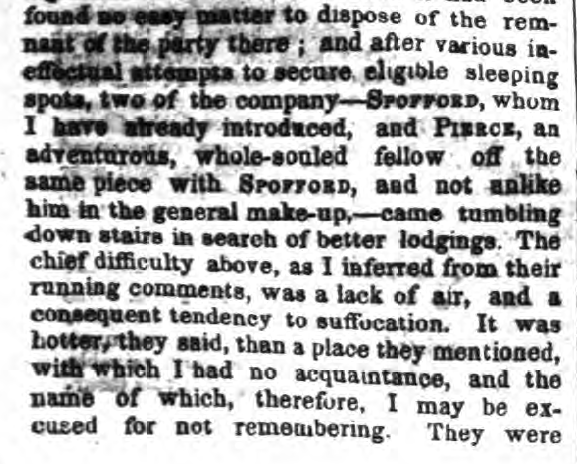 My last article identified the most likely location of the original cabin built by Matthew Beach and William Wood in the mid-1830s. 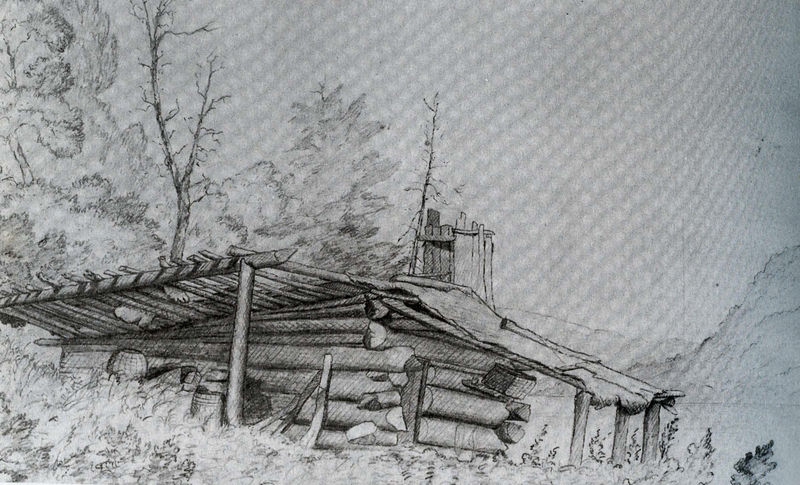 Wood remained on Indian Point until 1859, but sometime between 1844 and 1846 he had a falling out with Beach and built a separate cabin (shown in this 1851 sketch from Jervis McEntee’s diary). 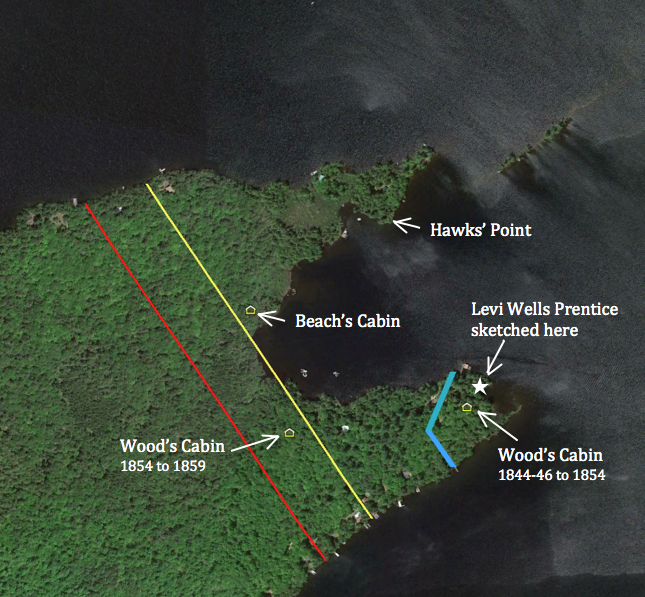 I began a new search to determine where Wood’s cabin had stood, using the 1851 sketch as a starting point. I feel confident in saying that the mountainscape in the background of the sketch is unmistakably Bluff Hill, which rises above the Bluff Point peninsula of Raquette Lake. So where would one see this particular view? 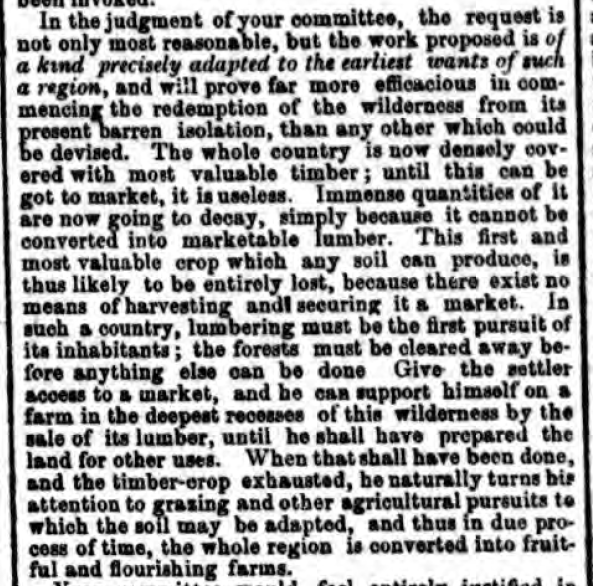 One might expect that each man’s cabin would have been located within their individual parcel when they obtained legal title to their lands in 1849. The image below shows that Beach was deeded 25 acres to the right of the yellow line, encompassing both tips of Indian Point. Wood was deeded 25 acres in a rectangular parcel between the red and yellow lines. 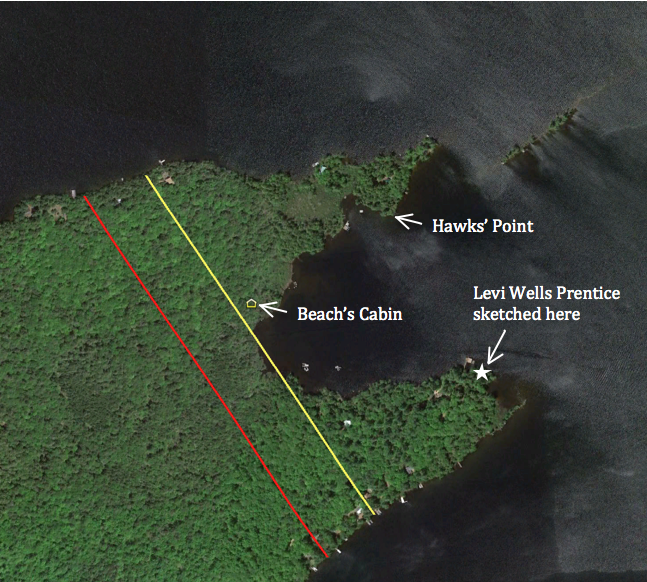 My theory of the location of Beach’s cabin has it on Beach’s property, so Wood’s cabin should have been within his rectangular parcel. However, after carefully canoeing along the shores of the inner bay between the two tips of Indian Point and along the south shore of Indian Point, I can unequivocally state that the view captured in the McEntee sketch could not have been seen from within Wood’s 25 acre parcel. The only potential location would be at the very back of the inner bay but Needle Island obscures the view of Bluff Hill from that vantage point. Why would Beach and Wood divide the end of Indian Point in a way that did not correspond to where the men’s cabins were located? 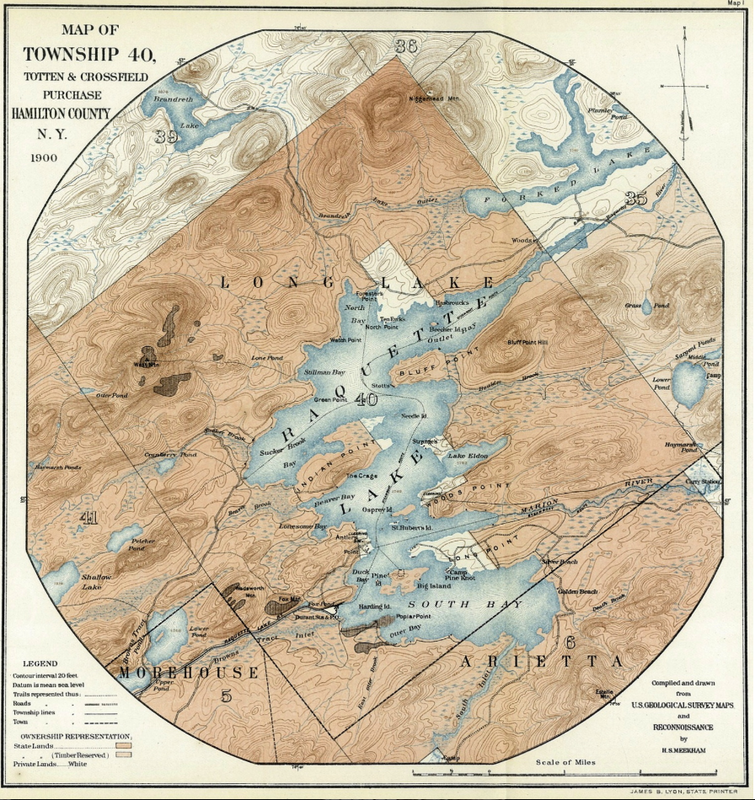 The answer comes from looking at the Township 40 Map of 1900. Notice that most of the straight edges of the property parcels are all lines that run parallel to the diagonal boundaries of Township 40. In 1773, Ebenezer Jessup was charged with surveying the boundaries of the Totten & Crossfield Purchase and segmenting the area into townships. The reason why the township’s west and east boundaries run North 27◦ West rather than straight north-south has been lost to history. 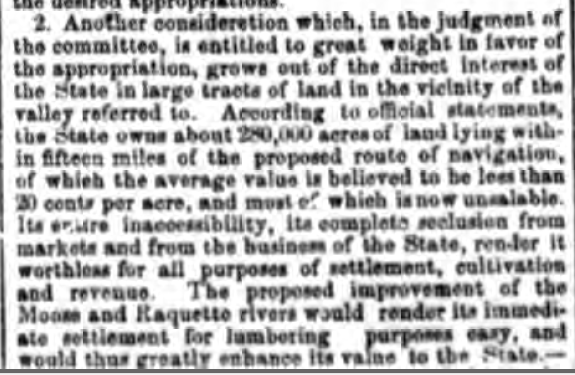 Nevertheless, it appears that in giving legal title to the men, Farrand Benedict and David Read chose an easier surveying technique to divide the land into equal 25 acre parcels, without regard to the location of the cabins. This realization opens up the possibility that Wood’s cabin actually existed on what was legally Beach’s land. 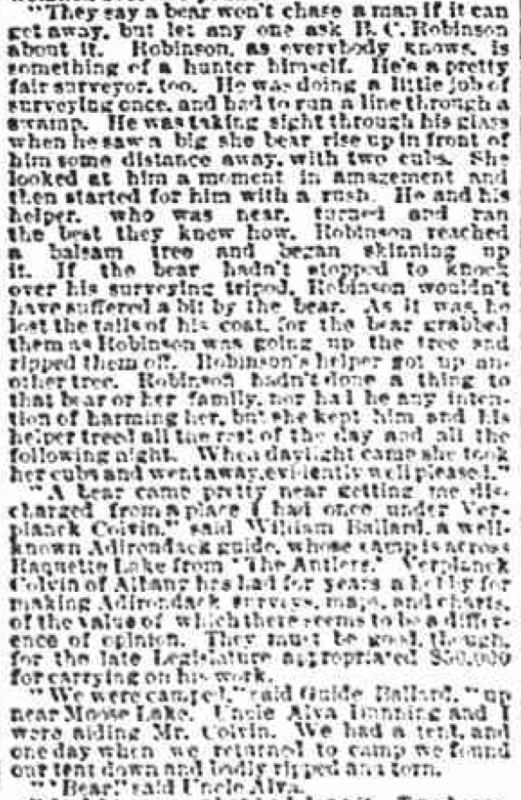 McEntee was not the only visitor who wrote about Wood’s cabin. 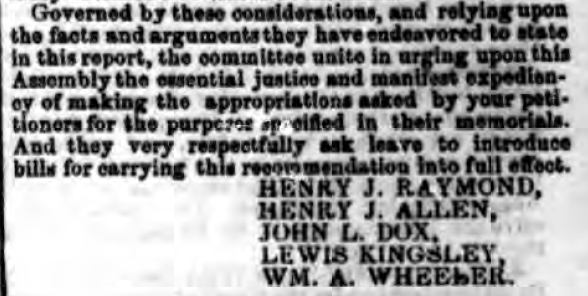 In 1855, Henry Jarvis Raymond, the founder of The New York Times and NYS Lt. 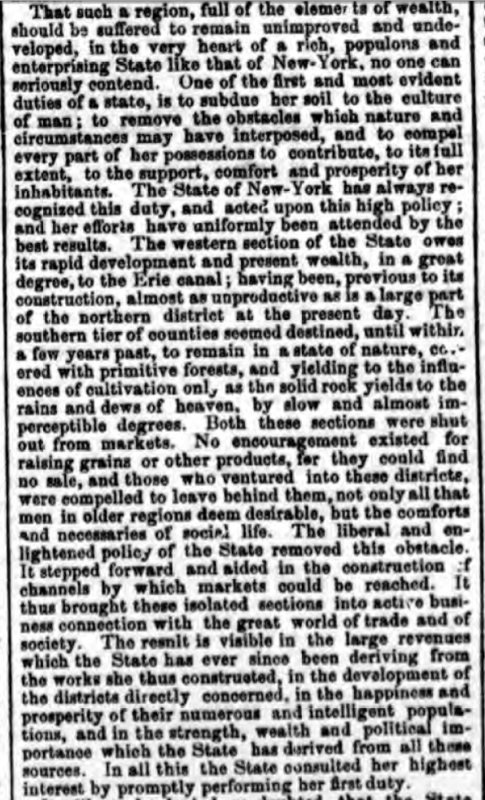 Governor, wrote of his visit to Indian Point. [Wood] and Beach in course of time disagreed, for in any part of the earth, no matter how secluded, two persons are enough for a quarrel; and a clearing of ten acres, even in a wilderness a hundred miles through, affords ground enough for a local dissension. So finding they could no longer live together, they agreed to divide their fortunes and have nothing to do with each other. Wood moved into a hut, half logs and half bark, some fifty rods from Beach. Fifty rods is 825 feet. From where I believe Beach’s cabin to have been, I ventured roughly that distance in each direction seeking to see if any point gave a view similar to the McEntee sketch. I found it at what our family calls Hawks’ Point (named for the family of Ken Hawks, current owners of Watch Point on North Bay, who camped here for many years). The view from here has a very close resemblance to the sketch. Surely this was the location of Wood’s cabin. 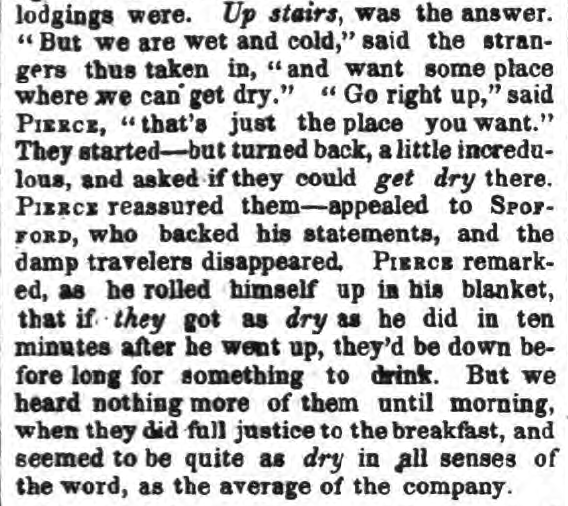 I was convinced until I read the entirety of Jervis McEntee’s diary from his 1851 visit. McEntee said of Wood’s cabin, “The house is built of logs with a bark-covered porch in front, and standing on a gentle elevation about fifty yards from the lake.” A cabin 150 feet back from the lakeshore on Hawks’ Point would be in a marsh and no longer have a view of Bluff Hill. 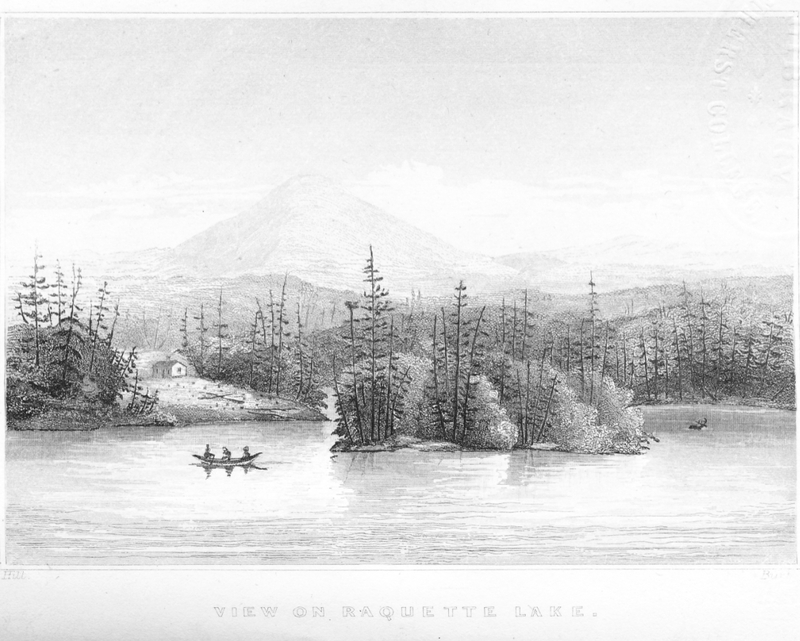 McEntee also states that, “Wood was not at home but we saw him coming over the lake soon after we reached his house…he had just now returned from ‘Blue Mountain’.” This could be interpreted to mean that they were able to see Wood coming north across Beaver Bay up from the mouth of the Marion River. There is no such view from Hawk’s Point. If Wood’s cabin had been on Hawks’ Point, Beach could have shouted over the water the short distance from his landing and would have not needed to fire gunshots in the air to get McEntee’s attention. Levi Wells Prentice’s 1877 painting titled “Raquette Lake from Wood’s Clearing” alludes to another possible location for Wood’s cabin. Prentice actually painted at least three versions from the same sketch. I believe the one shown below helps to identify where the sketch was drawn. 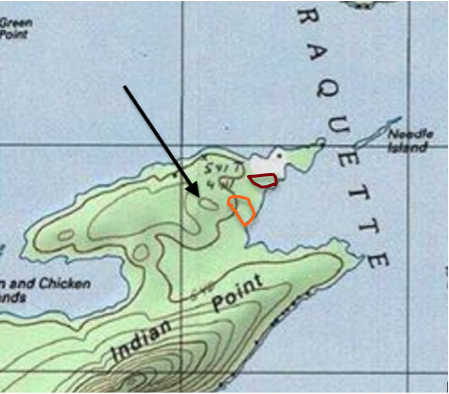 I believe the sketch was drawn at a spot (marked with a white star below) on a small inner cove at the far east end of the southern tip of Indian Point while looking south. The peninsula on the left of the painting is Woods Point, where William Wood’s brother Josiah lived. Osprey Island appears to the right across a small channel from Woods Point. The far shoreline is not actually the southern shore of Raquette Lake but rather Long Point. The mountainscape in the background shows the Blue Ridge, Wakley, and Metcalf mountain ranges that lie south of Raquette Lake. If one looks due east rather than south from here, you do see a view of Bluff Hill similar to the McEntee sketch. Sitting on the porch and looking south from here, you would see William Wood “coming over the lake” as he “returned from Blue Mountain”. 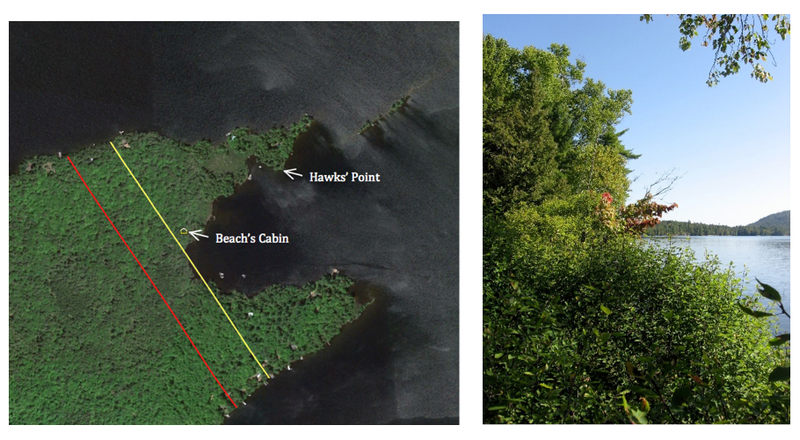 The distance from Beach’s cabin and the fact that I believe Wood left a windbreak of trees to the north of his cabin (seen in McEntee’s sketch) would explain why Beach had to fire gunshots in the air to get McEntee’s attention. Finally, there are stone piles that appear to be corner foundation points found where I believe Wood’s cabin to have been. My search would have ended here if not for two conflicting “facts”. Warren Reynolds recalls his father showing him the remains of William Wood’s cabin when he was a small boy in the 1930s. Only a corner joint of rotting timbers remained. Warren’s father claimed that his friend Billy Wood, one of Wood’s descendants, originally showed him the site. These remains were not anywhere near the tip of the southern fork. Instead, this cabin had been located just to the west of the line dividing Beach and Wood’s properties on the southern fork but closer to the inner bay of Indian Point. 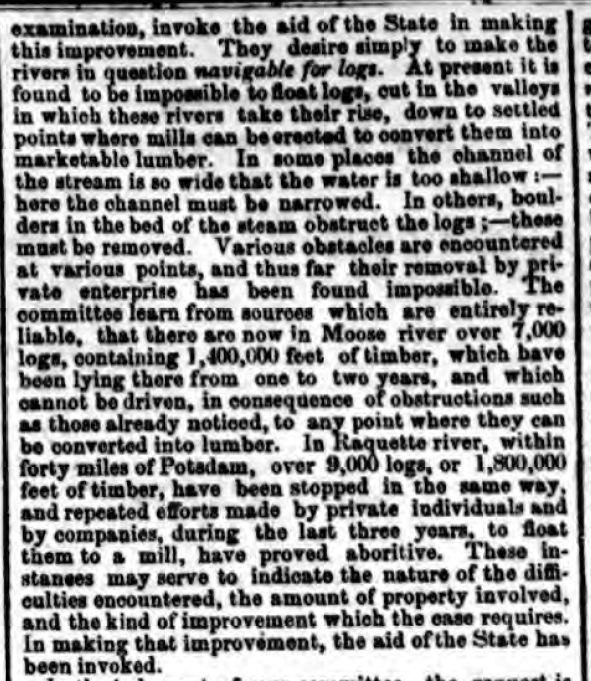 The second contradiction is Henry Jarvis Raymond’s 1855 comment that Wood’s cabin was “some fifty rods from Beach”. The location near the tip of the southern fork is almost 100 rods away from Beach’s cabin. My research of our family’s property deed revealed a clue that might explain these contradictions. 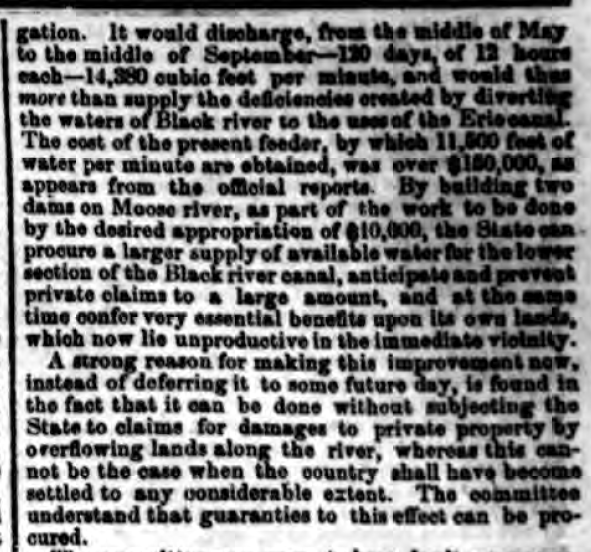 In 1854, Matthew Beach sold a 4.75-acre parcel to Albert and Gardner Eldred. The boundaries of this small parcel, in blue below, enclose the area where I believe William Wood had his first cabin. 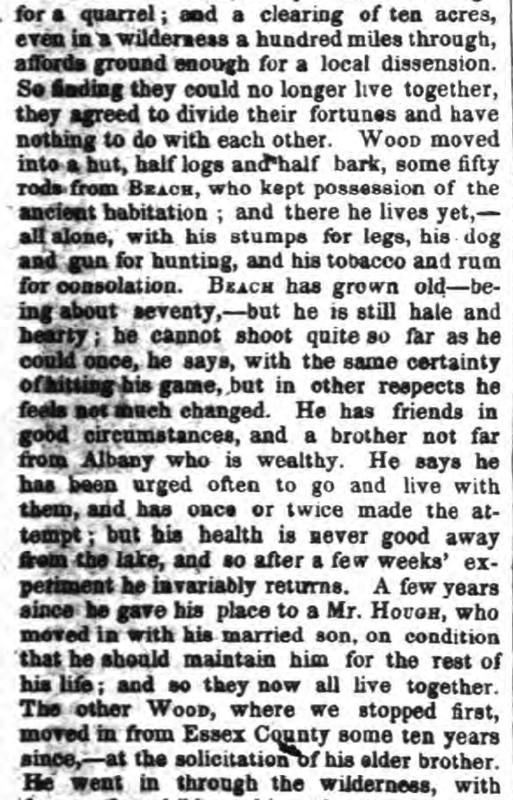 Either Beach forced Wood out of his cabin or perhaps by 1854 Wood had already begun to court Celia Ann Whitman, whom he married in 1858 after fathering their daughter Lydia in 1857. Did he choose to build a more suitable cabin to raise a family in, within the boundaries of his legal property? Based on Reynolds’ recollection and the supposition that Henry Jarvis Raymond visited this second cabin in 1855, I have marked an approximate location around fifty rods from Beach’s cabin. It is likely that Wood occupied this cabin from 1854 until 1859 when he moved to Elizabethtown. Today the sites have modern construction or disrupted landscapes that preclude a more in-depth ground search for evidence, but I feel confident in my conclusions. I know where Matthew Beach and William Wood built their original cabin (depicted in this 1840 sketch by John Hill) on Indian Point. Or at least I think I know, or perhaps I should say I have deduced a pretty darn good educated guess. I welcome other’s critiques of my assumptions. After discovering the location of the mysterious 1878 Thacher cabin, my obsession turned to searching for the first settlers’ home on our land. The above sketch offers little in the way of accurate perception of distances given that the opposite side of North Bay appears as close to Needle Island as the tip of Indian Point. And don’t get me started on the apparent thickness of Needle Island. Yet the drawing holds some surprisingly valuable clues. One might even question if this could possibly be a view of Needle Island and Indian Point. Thankfully, there exists exactly one more piece of contemporary evidence on the cabin’s location. 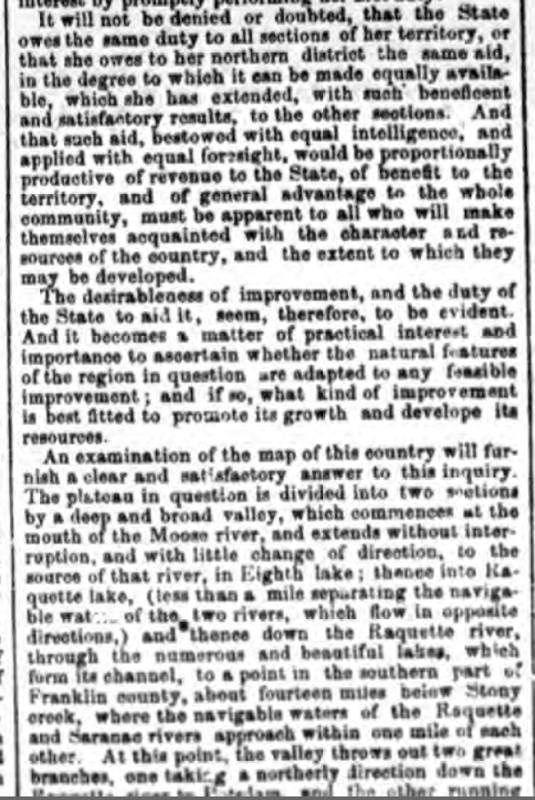 A portion of the 1860 map of the Headwaters of the Racket River by F.A. Merritt shows the cabin on the north fork of Indian Point. Here again, the proportions do not reflect reality and the exact location of the cabin cannot be determined from the map. Although the sizes of the islands appear gigantic, my interpretation is that the very tip of the north fork appeared to the mapmaker as two small islands (B & C). If surveyed in early spring with unusually high water, what is today swampland separating A from B and B from C, could have been an open channel of water. This would imply that the cabin was located within the broad area marked A. 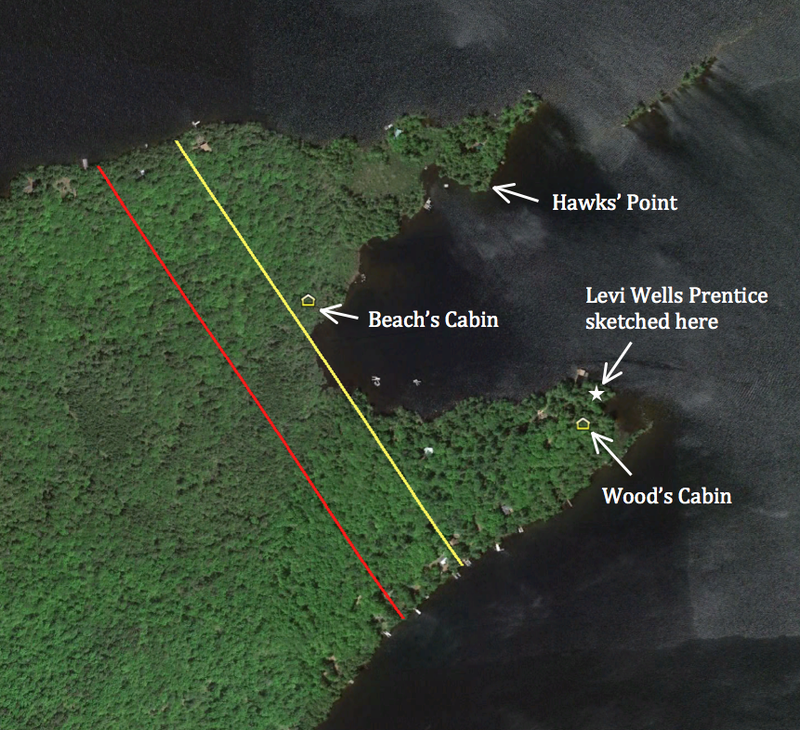 Having consulted the two pieces of evidence that provide graphic clues to the cabin’s location, I turned to the pitifully few cabin descriptions written by Beach and Wood’s visitors. We heard three or four rifle shots in the direction of Beach’s, and rowing over there we found a skiff and a birch bark canoe and me Beach and an Indian at the landing. Beach told us that a party had arrived and probably the one Brainerd was expecting…I had quite a curiosity to see him, and walking up to Beach’s house we found the party there. The words “walking up to Beach’s house” appear to correspond with the 1840 drawing’s perspective that the cabin was on a slight rise of land above the lakeshore. 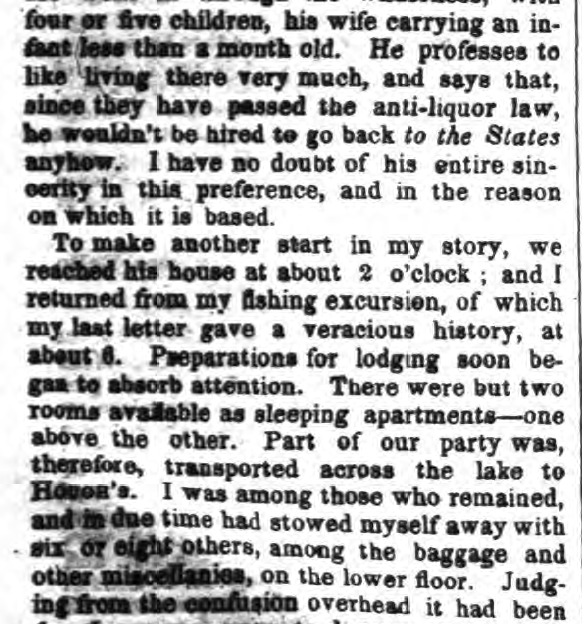 The description also implies that McEntee could not hear or see the party at the cabin from the shore. 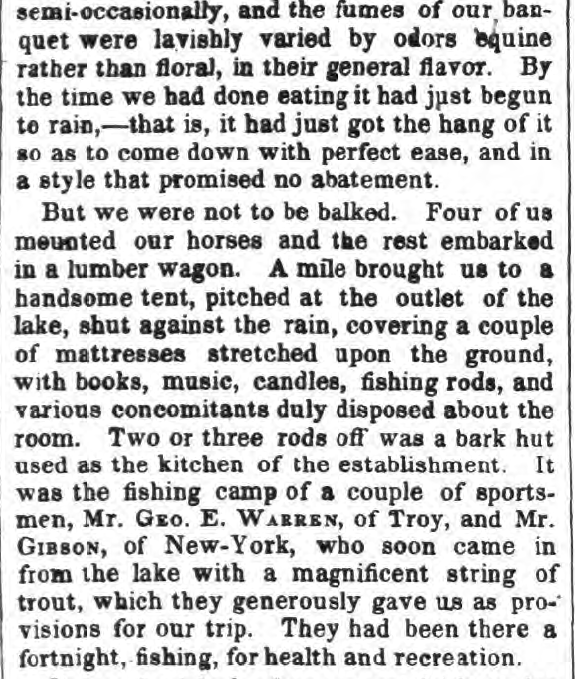 C. W. Webber wrote of his 1849 visit: “Securing our boat, and taking out our equipment, we walked to the hut, but a few rods from the edge of the lake”. A rod is 16.5 feet, but the meaning of “but a few” could be interpreted to mean as little as two to perhaps five rods. This would imply that the cabin could have been between 33 and 82 feet of the shore. Given McEntee’s words, I suspect the cabin was at the higher end of this range. 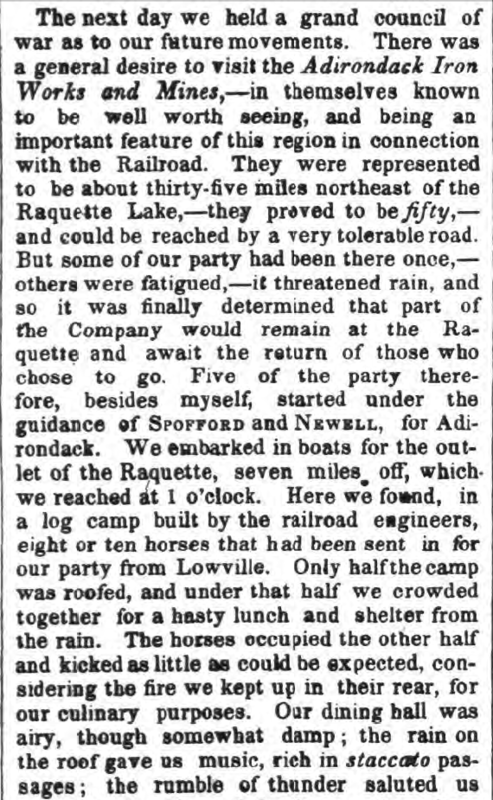 An enticing yet cryptic clue comes from David Read’s 1848 letter published in Joel Tyler Headley’s The Adirondack or Life in the Woods. About five hundred yards from Beach’s hut, stands a lofty pine tree, on which a grey eagle has built its nest annually during the nine years he has lived on the shores of the Raquette….From his cabin door he can see them in sunshine and storm. If only Read had described where this lofty pine tree itself was located. These writings did not help to zero in on the cabin’s location, so modern science was needed to aid the search. 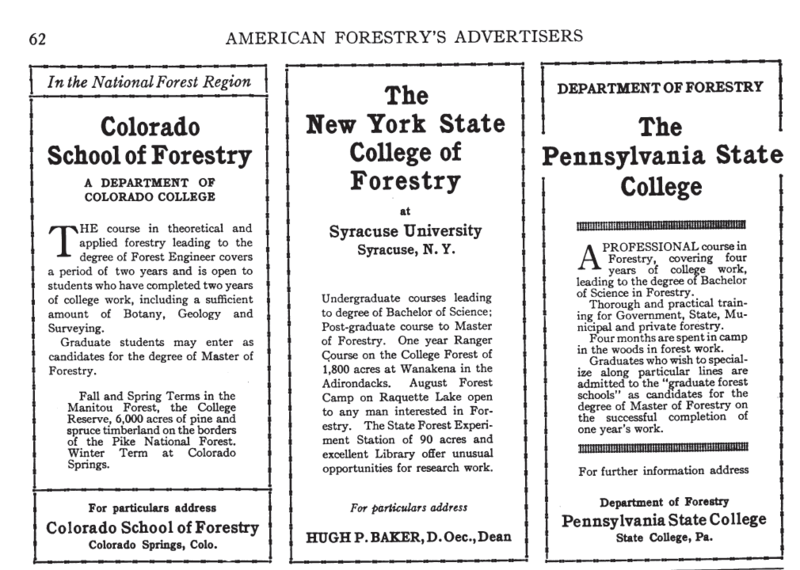 Dr. Mike Kudish, professor emeritus of forestry science from Paul Smith’s College suggested that the cabin and cropland clearing would likely today be a stand of spruce and white pine, secondary species that would have naturally reforested the open clearing. Using an aerial photo from the early spring and Google Earth, I determined the GPS coordinates of the corners of two search areas (orange and red) mostly devoid of deciduous trees. 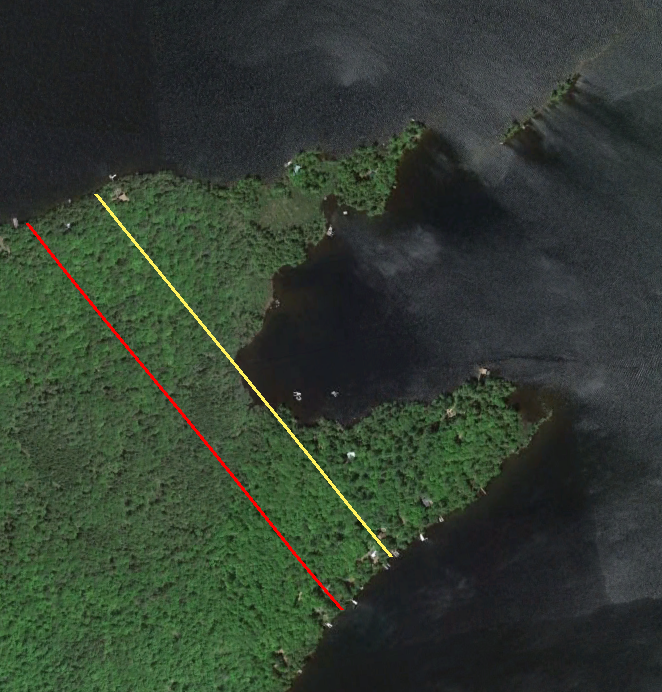 The yellow line is the western boundary of Matthew Beach’s property. Of course an aerial photo does not reveal what the reality is on the ground. 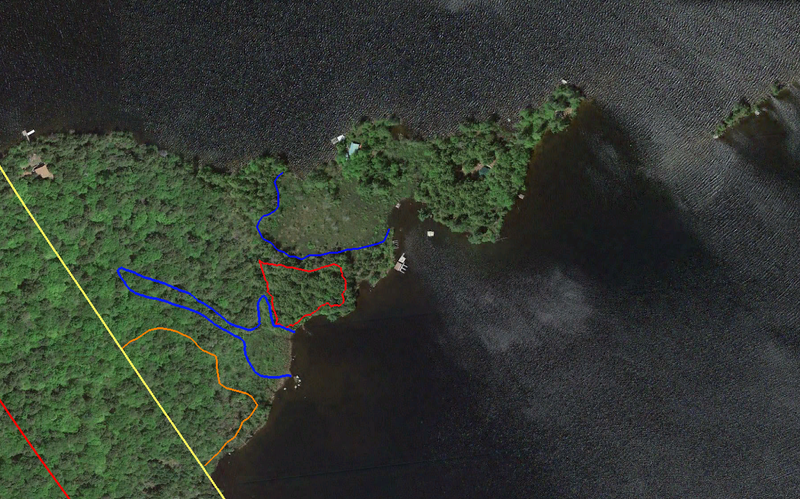 Walking the two search areas with professional GPS equipment, I mapped the areas in blue that are wetlands and the red and orange areas which were the only ground suitable for the cabin’s location. 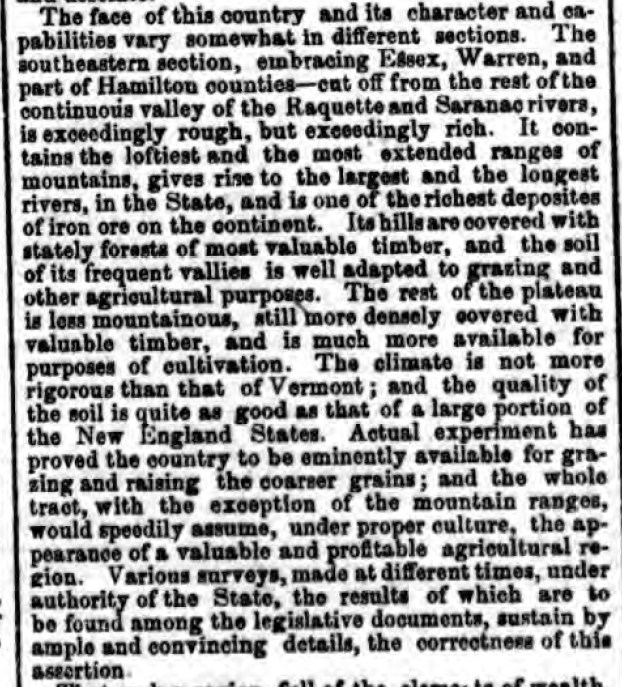 Lacking a foundation or even stone pilings at its corners, it is not surprising that all surface evidence of the cabin has rotted away in the intervening 135 years since it was last occupied. With the help of the Adirondack Research Consortium, I contacted Dr. Christopher Wolff of the SUNY Plattsburgh Anthropology Department. 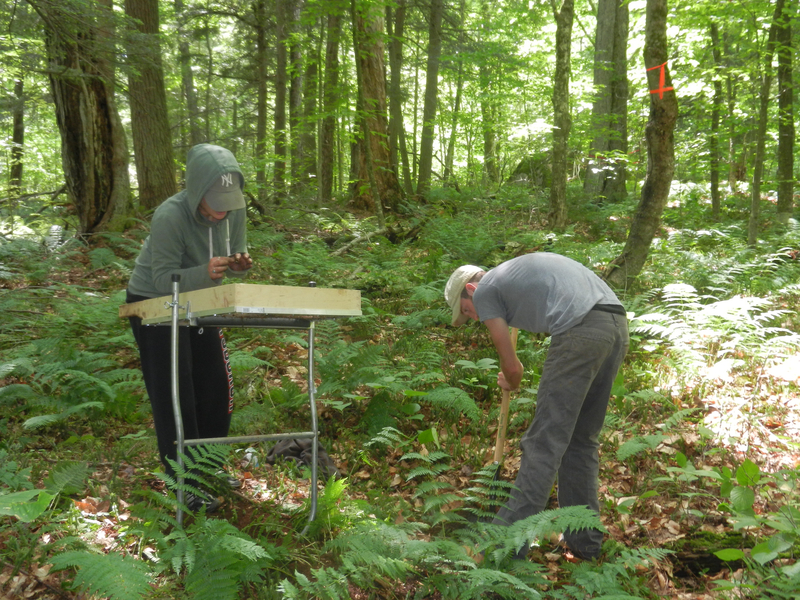 Dr. Wolff and two graduate assistants spent two days digging ten shovel test pits in each of the search areas. Alas, we found no evidence of the cabin’s location. In fact we found no man-made artifacts whatsoever. 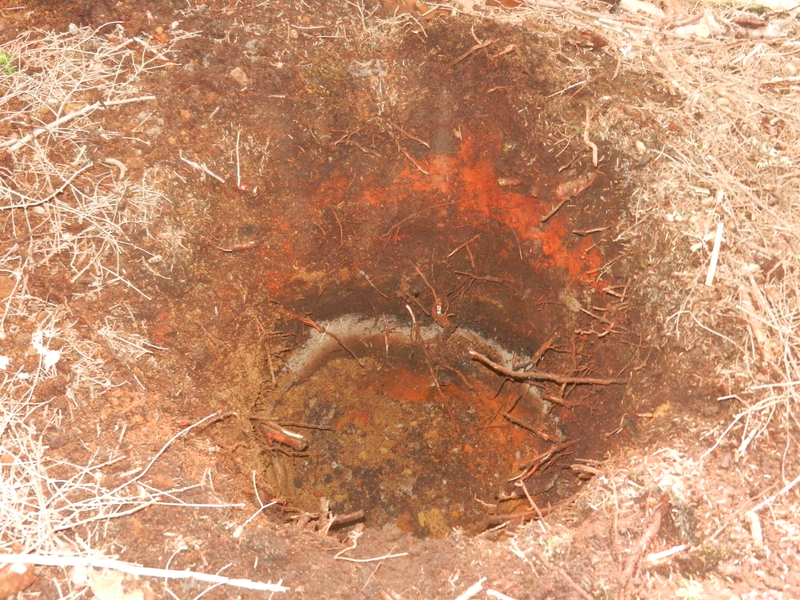 We did however discover that there is a burn layer in the ground about 8 to 12 inches below the surface (the grey ash in the photo). Dr. Wolff said it either indicates slash and burn cultivation at the hands of Beach and Wood or Native Americans, or a forest fire long ago. The burn layer is present throughout the north fork of Indian Point and thus does not provide any clue to the cabin’s location. 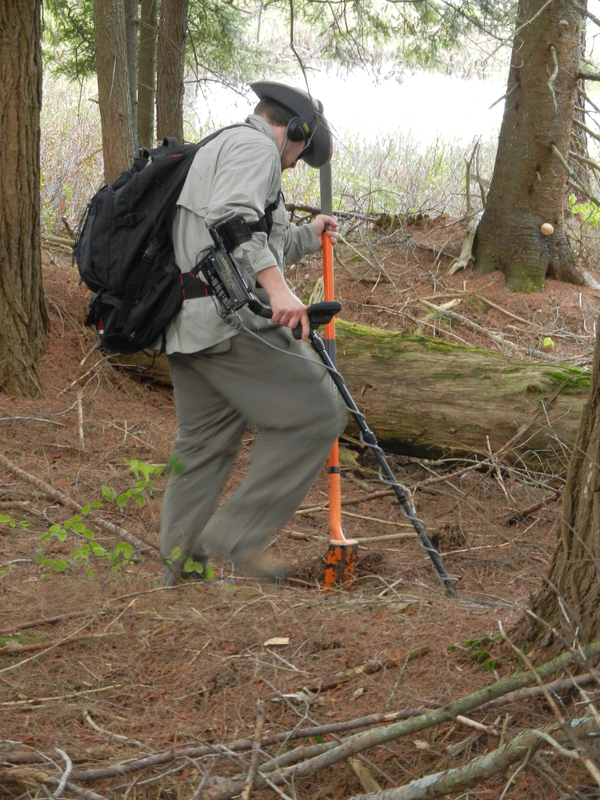 The Empire State Metal Detector Association based near Albany also aided the search. Tim Myers and Peter Teal travelled up to Indian Point for two days of detecting. Once again the search proved elusive. 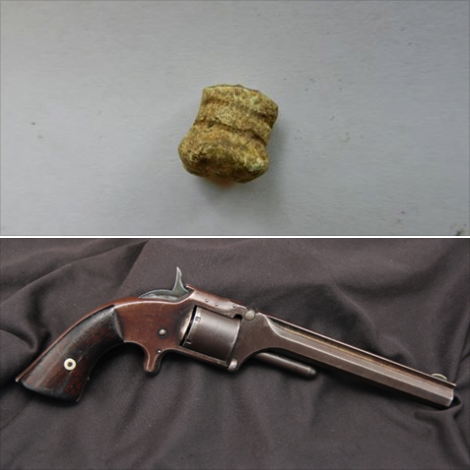 No artifacts were found in the red search area and the further west orange search area revealed only the lead bullet shown below which was fired from a .32 Smith & Wesson Number 2 Army Revolver (manufactured between 1861-1874) and a piece of iron from a chain link. Both of which post date the time of Beach and Wood. 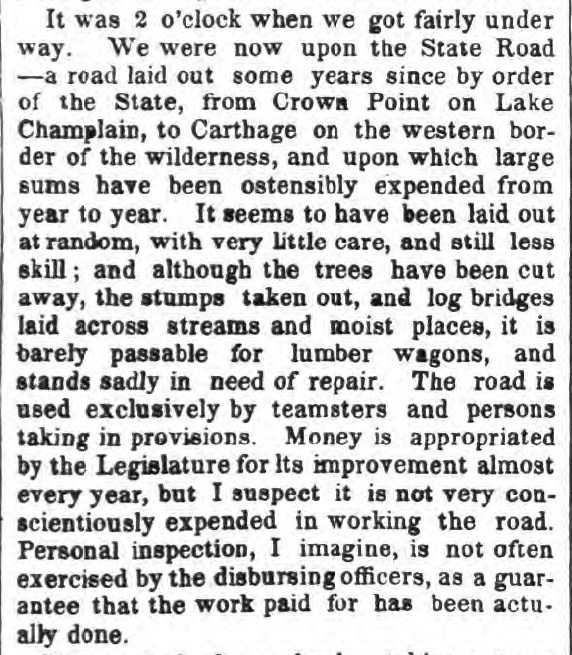 Meyers and Teal were very surprised to find so little in an area occupied from 1837-1870; however, Meyers commented that they have done detecting at sites clearly marked as homesteads on old maps and come up similarly empty-handed. 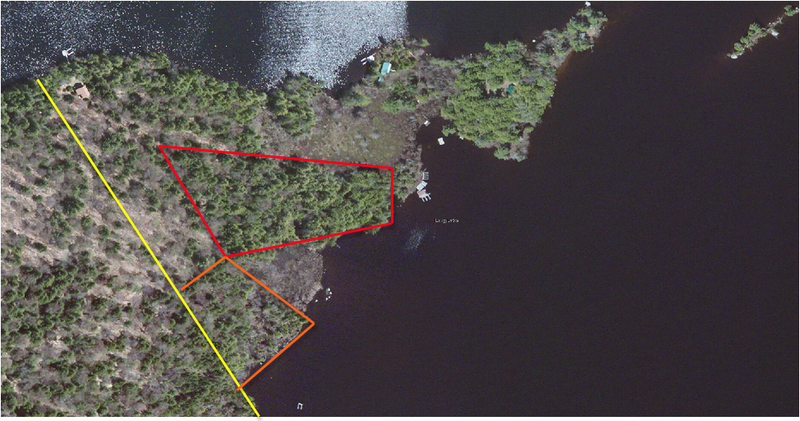 Both men believe that the orange search area is much more suitable for the cabin site, given that the red search area is bordered on two sides by wetlands and susceptible to flooding. The mystery would have remained unsolved if not for the following letter, written by Ms. Howell to Amanda Benedict during the 1873 women’s botany expedition chronicled in Barbara McMartin’s book To the Lake of the Skies. The accompanying sketch is a view from our camp [on Indian Point] which we were looking upon when at supper…The little boat near the island [Needle Island] which is one of our own is trying to approach the splendid buck, which is swimming with all its might toward the west and will evidently reach land before the boat overtakes it. Near the boat on the end of the island is the Eagle’s nest which for many years was the home of a family of Osprey. Alone this text offers no meaningful insight, but it is the next paragraph of the letter that enlightens. 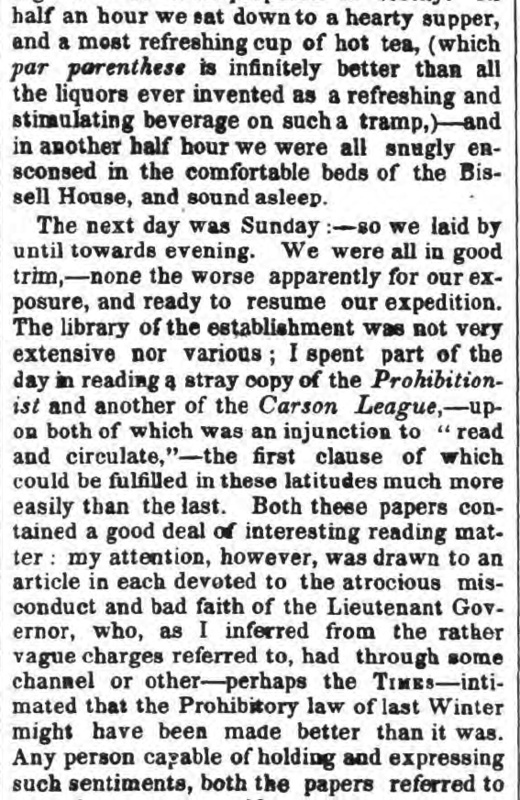 Ms. Howell’s letter proceeds with a verbatim plagiarizing of two whole paragraphs of David Read’s 1848 letter in which he speaks of the “lofty pine tree” 500 yards from Beach’s hut. We do not know if Ms. Howell included these words in her original letter or if Benedict placed them there when transcribing all of the expedition letters. 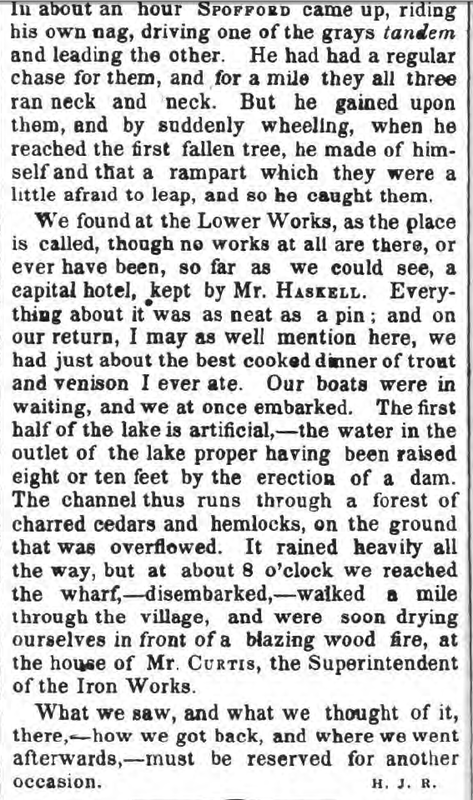 However, I think it is clear that the writer is implying that the Eagle’s nest on the west end of Needle Island in 1873 is one and the same as that seen by David Read in 1849. 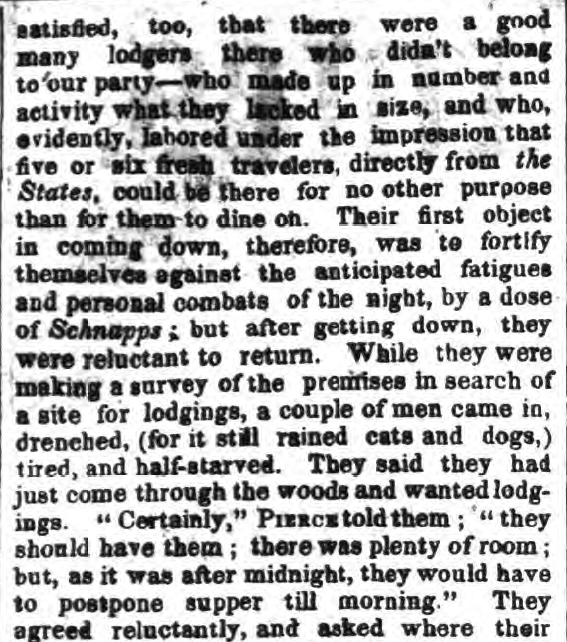 This is very plausible as John Plumley and Amos Hough, as close as family to Matthew Beach, were among the guides with the women’s expedition camping on Indian Point. They would have known and could have told Ms. Howell and Amanda Benedict of the lofty pine and eagle’s nest’s history. It is also likely that Amanda Benedict would have read and indeed might have had with her on the trip her uncle Joel Tyler Headley’s book in which David Read’s letter was published. A closer study of the 1840 sketch of Beach and Wood’s cabin reveals corroborating evidence of this theory. If you look closely, the second pine tree in from the west end of Needle Island is topped with a horizontal surface rather than coming to a point. No other tree in the drawing has a similar top. Could the artist have been attempting to indicate an eagle’s nest? 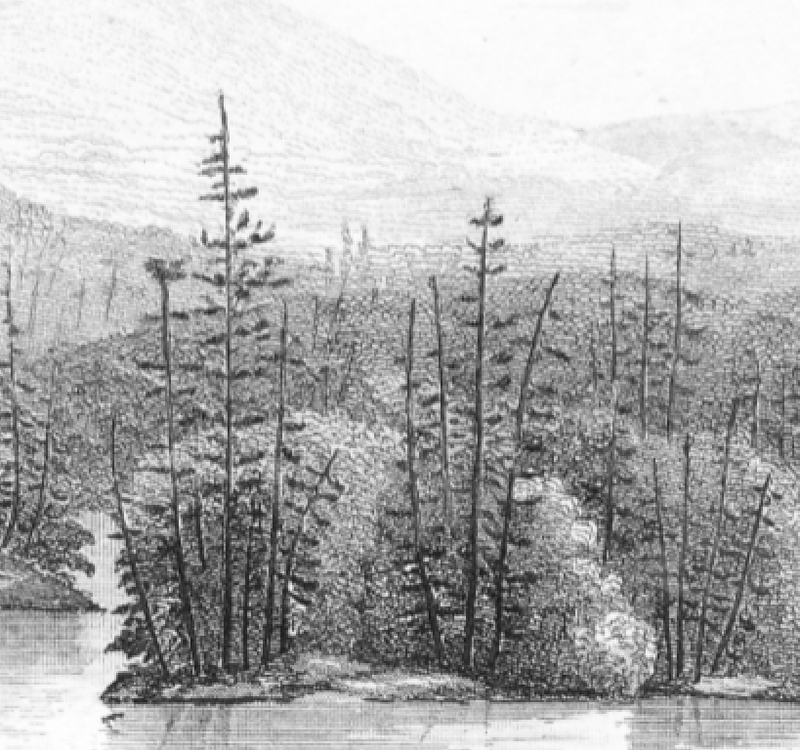 A similarly close look at the drawing of the cabin clearly shows a hill rising behind and above the cabin with a few trees on it. I believe this hill to be the small rise indicated by the arrow in the topographical map below. 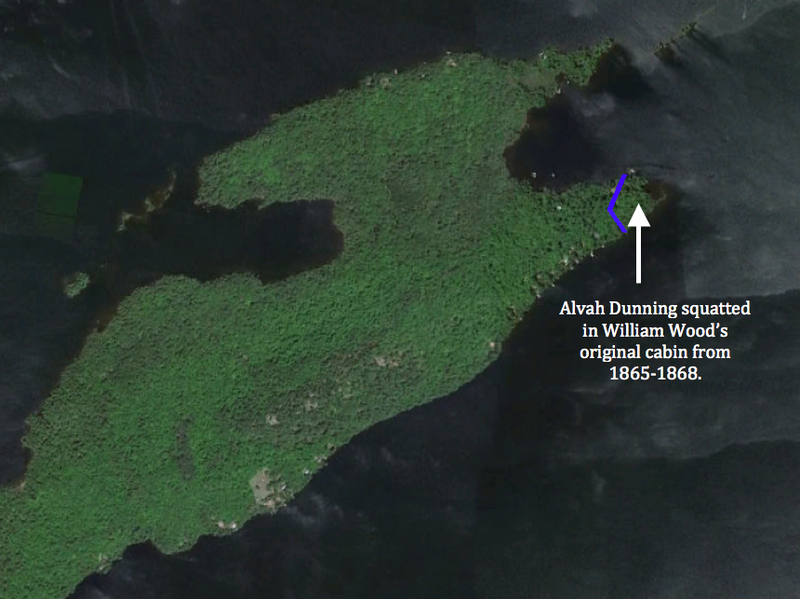 Putting together all of these clues, I theorize that the cabin was located at least 500 yards away from the west end of Needle Island, that the island was visible from the vantage point of the cabin, and the area northwest of the cabin had a higher elevation. Needle Island is not visible from within the red search area, blocked by the portion of Indian Point between it and the island. 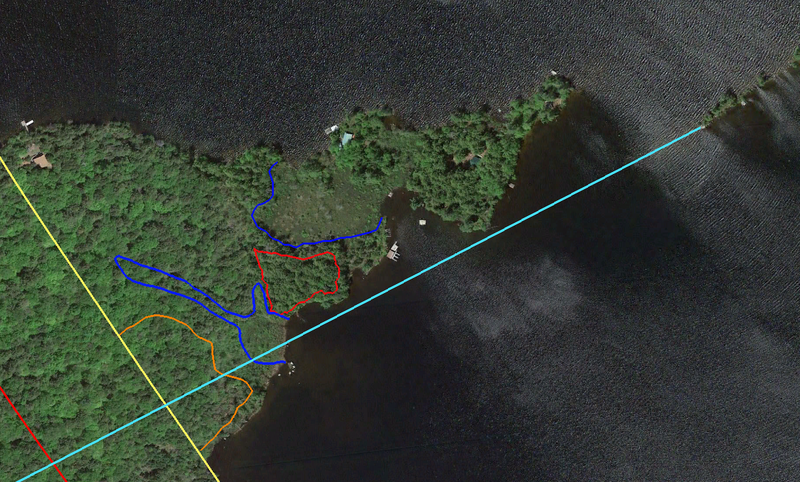 Also, the red search area is almost completely level with no hill near a cabin’s possible location. I am convinced that the original cabin must have existed in that portion of the orange search area south of the light blue sight line from Needle Island. I welcome any suggestions for how to search for definitive evidence in this area. However, even if I never find a holy grail of an artifact, I am content with my current conclusion, and my obsession has been sated. Among the many who visited Matthew Beach and William Wood on Indian Point, Henry Jarvis Raymond is notable as the founder of The New York Times. Raymond was also the elected Lt. 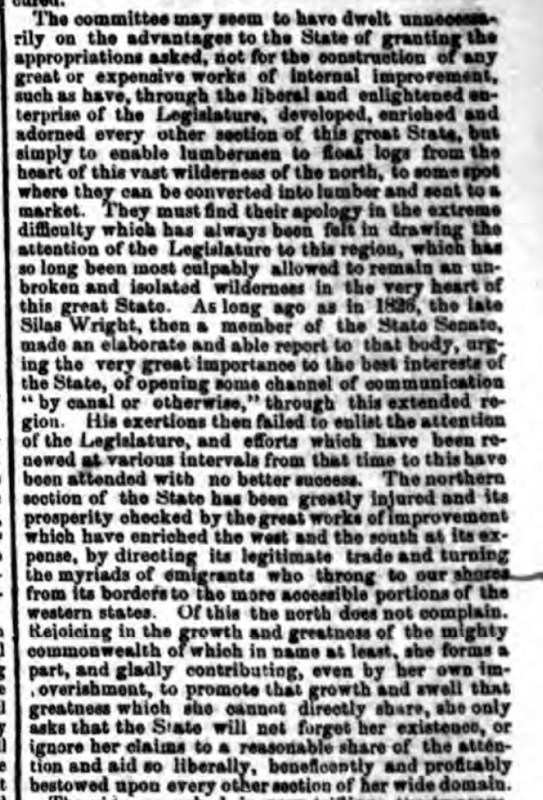 Governor of New York State in the summer of 1855 when he travelled through the region. He published four letters detailing his Week in the Wilderness. 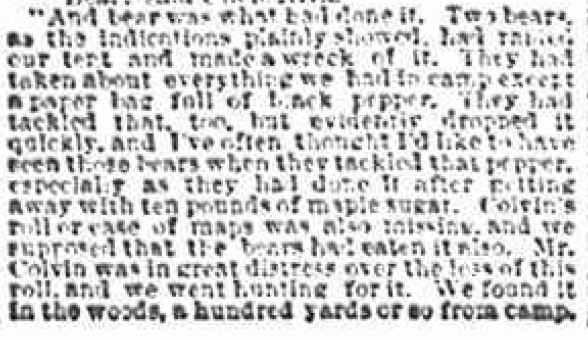 I have republished here his second letter which describes his time at Raquette Lake and at the Iron Works in Adirondac (present day Tahawus). 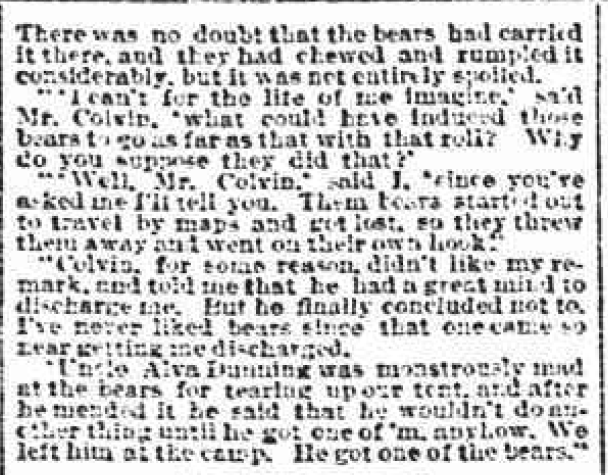 Alvah Dunning was perhaps the most famous of Raquette Lake guides, alleged to have helped lead the first excursion of sportsmen to Raquette Lake at age eleven. Born in Lake Piseco in 1816, he lived there until 1860 when his neighbors’ rightful condemnation of his abuse of his wife forced him to flee. 1 From that moment, he chose to remove himself from society in favor of the freedom of the wilderness. Yet civilization’s constant barrage upon him eventually brought him to a tragic end. According to Dr. Arpad Gerster, the growing attraction of wealthy sports to Blue Mountain Lake soured the tranquility that Dunning sought. 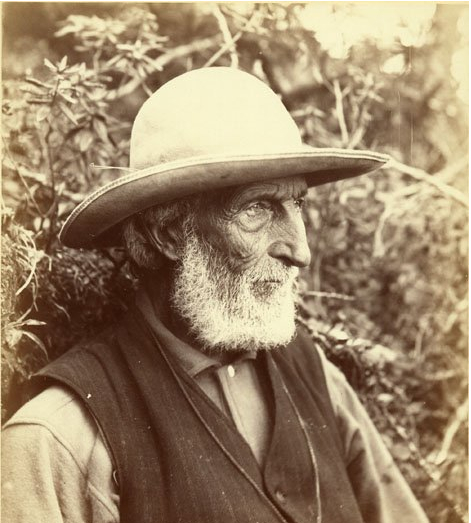 4 My great-great-grandfather George Hornell Thacher began visiting Blue in 1862 seeking his own solitude and yet he represents the first wave that drove Alvah further west. Ironically, GHT followed Alvah’s footsteps to the same spot 15 years later driven by the growth of tourist hotels on Blue. 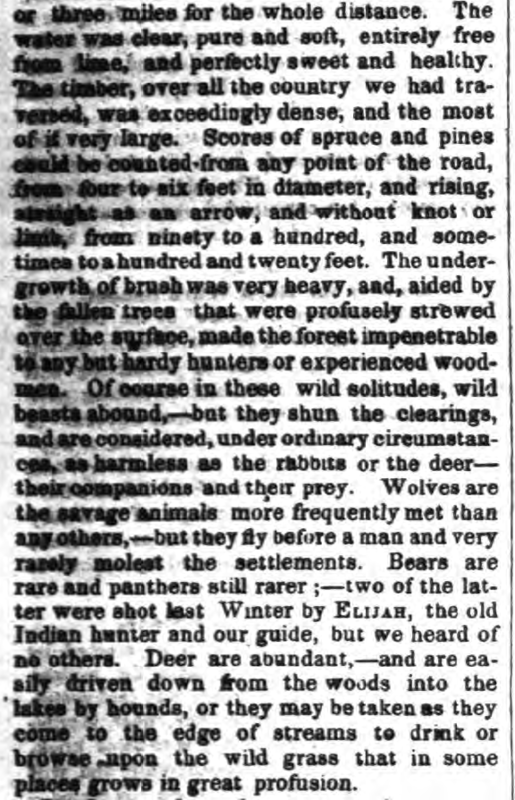 Only men who possess strongly marked personalities are capable of making strong friends and as equally strong enemies…it seems that Alvah is well liked by sportsmen whom he has served…Others dislike him, and among Adirondack guides he is, for some reason, the most unpopular man in the woods. 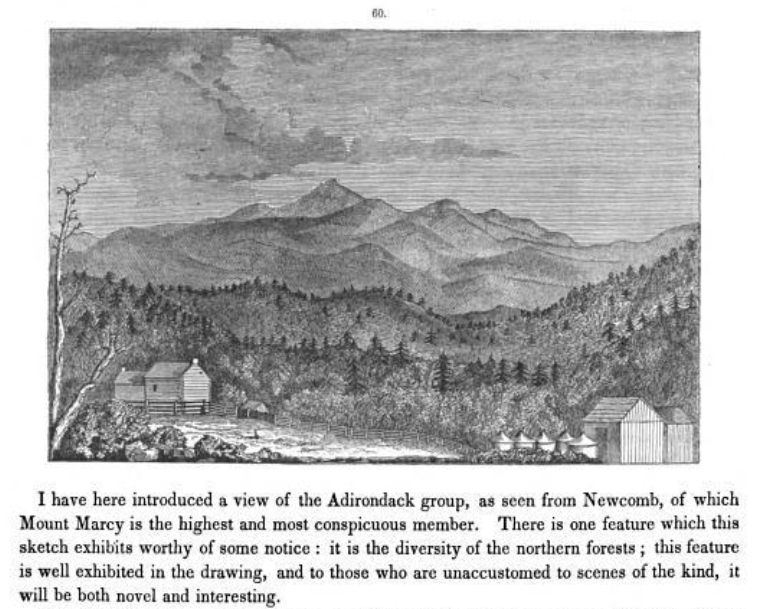 There is no small irony in the fact that the writings of Mather, in Forest and Stream, brought an even greater number of adventurers into the Adirondacks. Forest and Stream became a prominent voice championing the forest conservation and game regulations that infringed upon Dunning’s freedom. He then built a cabin at Brown’s Tract Inlet and later the one shown below on an island on Eighth Lake. Mather attempted to remain in contact with Alvah as late as 1896 according to this classified placed in Forest and Stream. 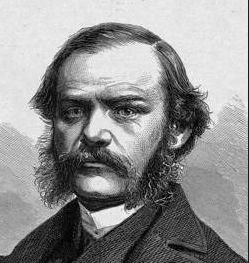 While Mather and other writers in the popular press always expounded on Dunning’s expertise, they also often portrayed the man as a simpleton, condescendingly alluding to his lack of understanding that the earth is round, the reasons for tides, and giving Alvah’s voice a foolish dialect. Dear Sir: Some time ago Ike Kenwell asked me to get you twenty-five pounds of brook trout. I done so. He offered to pay me, but I did not take any pay. Just now I am out of baking powder and would be very much obliged if you would send me some. News of his exploits often made the press. 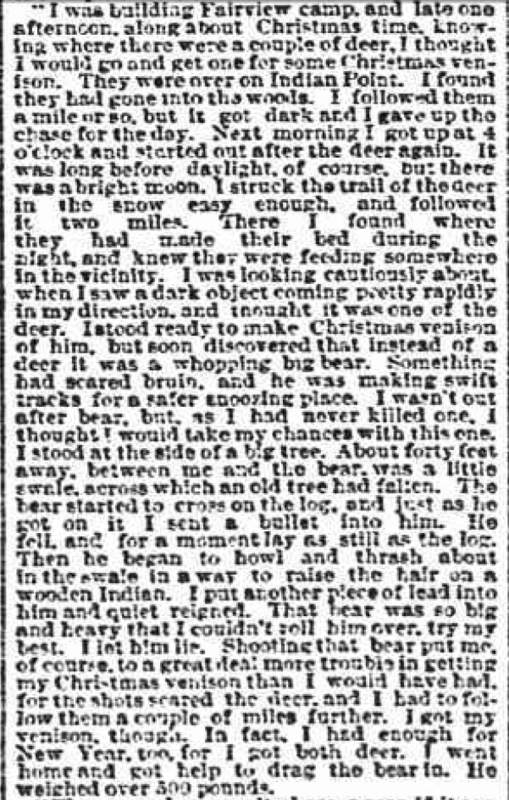 In the winter of 1894 came a report of his unfortunate death. Forest and Stream magazine reported that Alvah had fallen on the ice of Raquette Lake and cracked his skull. 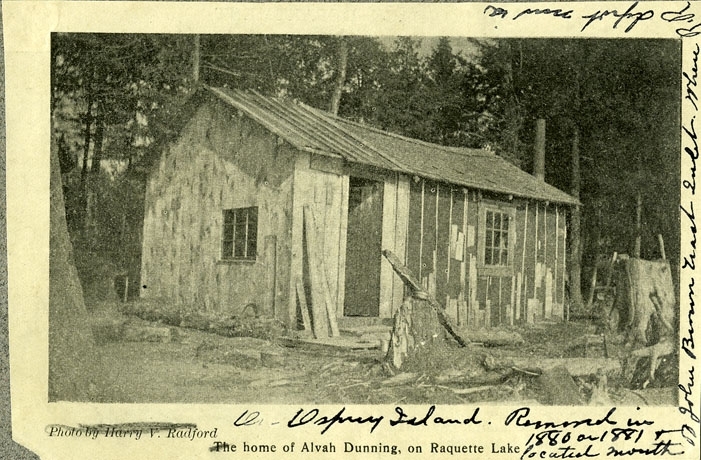 He was brought to William S. Durant’s Camp Pine Knot where a doctor attending him said he would not recover. The magazine lamented “That such a man should, after long years of peril by field and flood, come to his death by a fall on the ice such as one might get on Broadway, is one of the ironical phases of fate.” 11 Fortunately for Alvah, the news of his demise was premature and he recovered to live another eight years. Modern civilization, which he had sought to escape all his life, tragically ended that life. 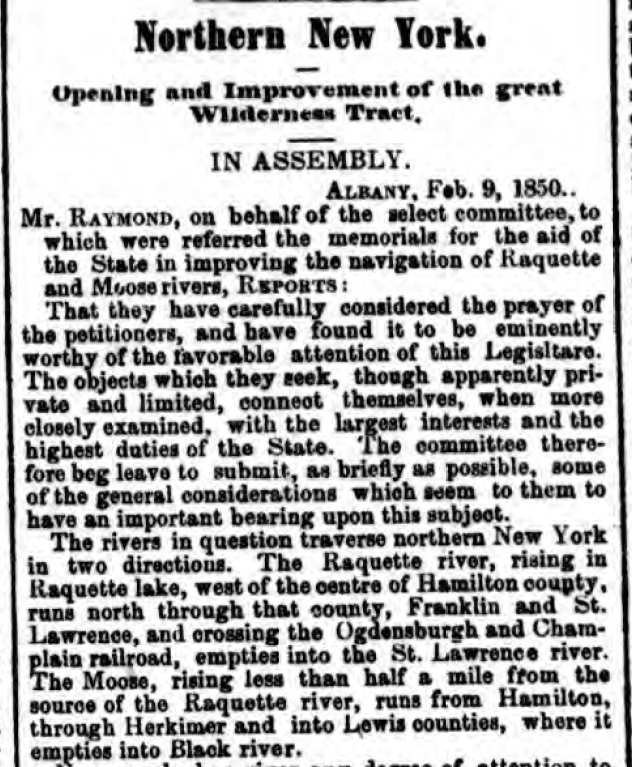 Prior to his visit to Matthew Beach and William Wood’s cabins on Indian Point in 1855, Henry Jarvis Raymond was instrumental in securing the funding from the New York State Assembly to make the necessary infrastructure improvements to turn the Raquette River and the Moose River into public highways for the transportation of logs through the vast wilderness of the Adirondacks. 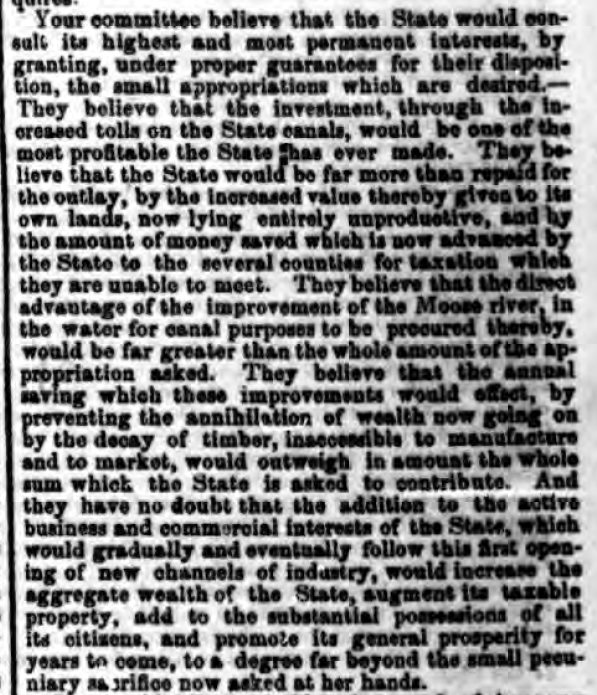 Here is a reprint of the 1850 NYS Assembly committee report which led to this achievement as published in the March 1, 1850 edition of the New York Morning Courier. 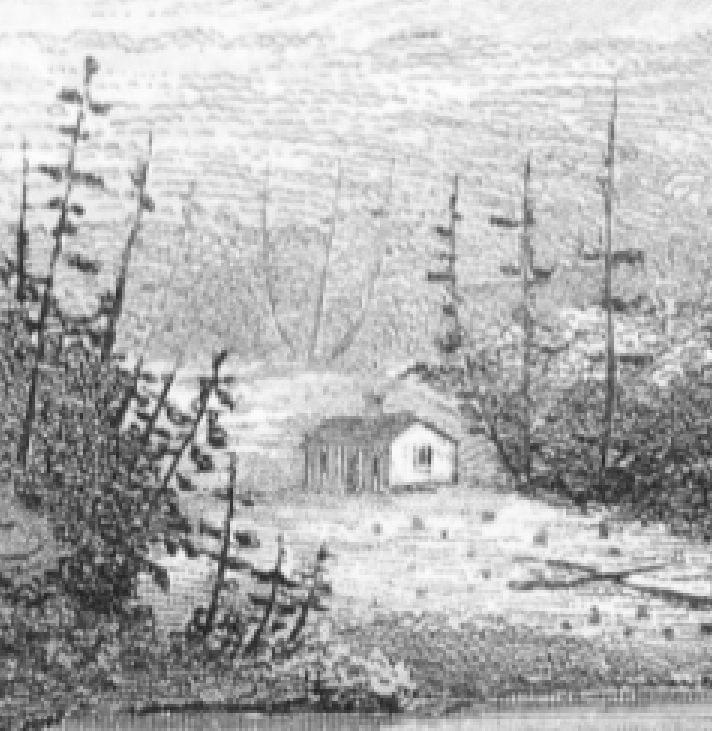 Thus Prof. Ebenezer Emmons described his arrival on my family’s land in 1840, captured in this sketch of Beach and Woods’ cabin by John William Hill. 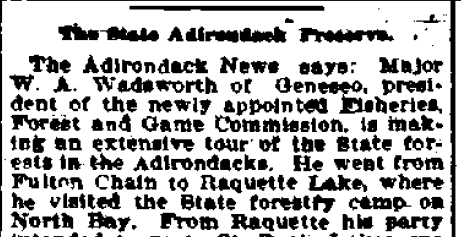 Emmons’ term for the high peaks region was adopted and expanded to describe all of the area now known as the Adirondacks. 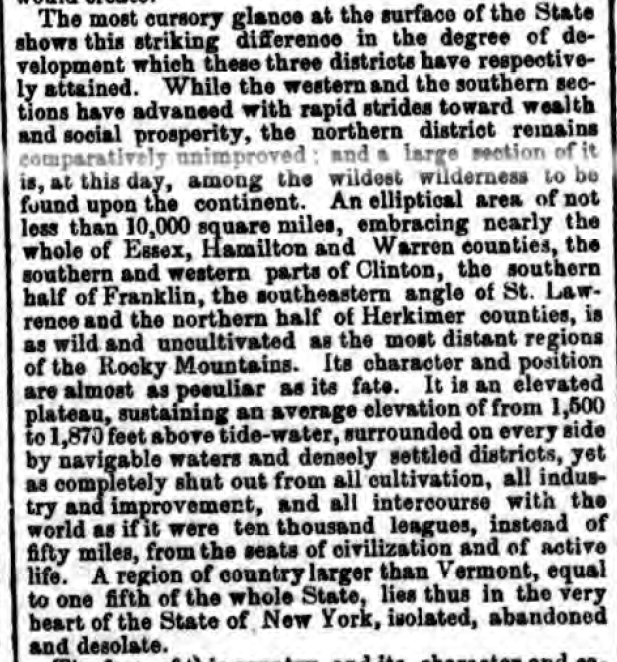 While traveling with Williams College President Hopkins and Hopkins’ brother Emmons’ enthusiasm for discovery got the better of him according to the 1896 biography. Governor Marcy selected Emmons to lead the geologic survey because of his preeminence in the field best expressed a century later by Cecil J. Schneer. The long-term impact of Emmons on the Adirondacks has more to do with the language and art work in his Survey reports. His writing romanticized an idyllic location that previously had been portrayed as cold, swampy and dreary. 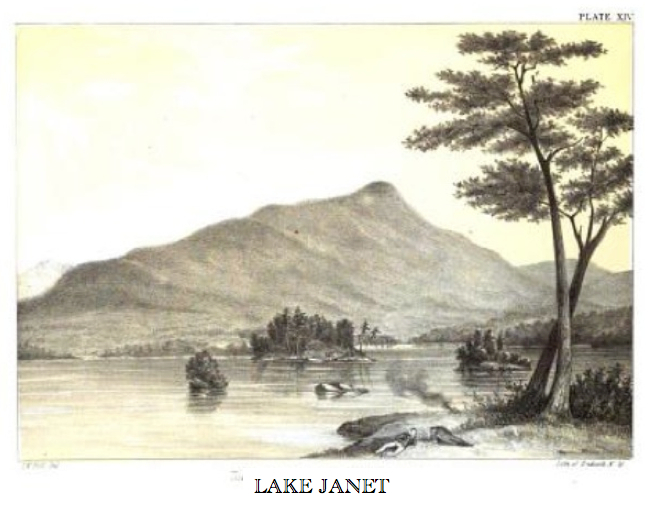 His reports were accompanied by some of the first drawings to show the public the majestic beauty of the Adirondack mountains, lakes and streams. 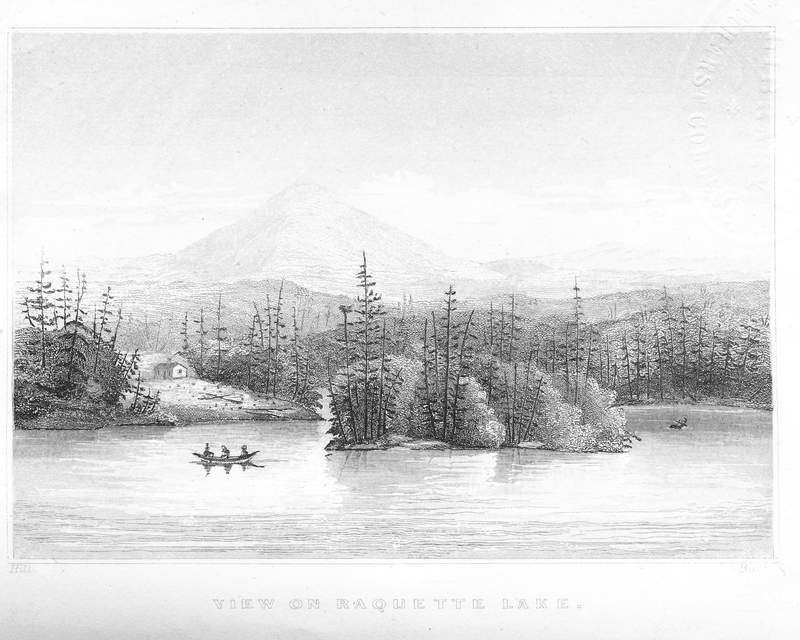 He gave an attractive description of Raquette Lake, which others ascribed to the region as a whole. Historian Philip Terrie places Emmons in the context of his times. 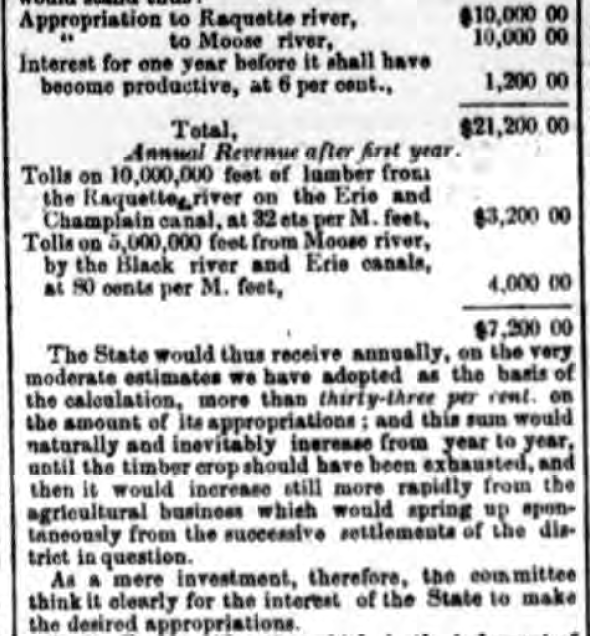 However, Emmons also promoted the economic exploitation of the natural resources within the Adirondacks. According to Terrie, Emmons had a vision of an “intensely populated and cultivated landscape” that embodied within one man the conflict between natural preservation and resource use, which still confounds us today. 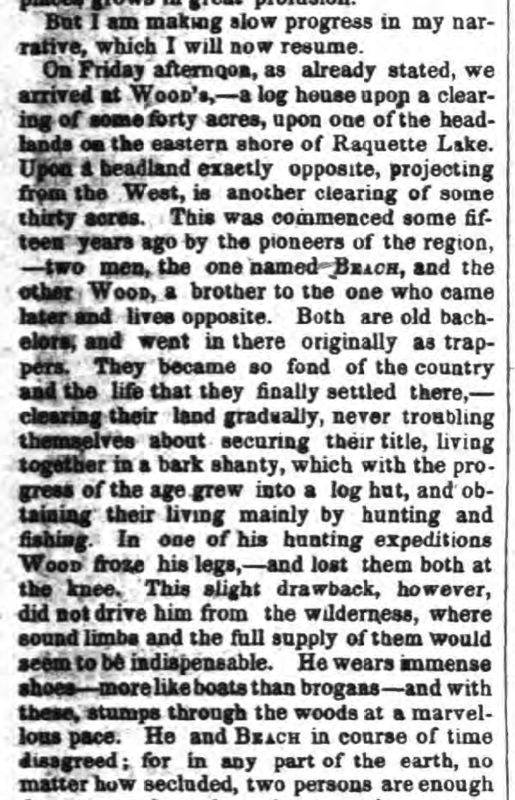 It is probable that the indomitable pioneer spirit of Matthew Beach and William Wood and early settlers of Long Lake and similar hamlets caused this vision to flourish as Emmons described. Beach and Woods’s farm consisted of several acres of crops and hay pasture for up to ten cattle. 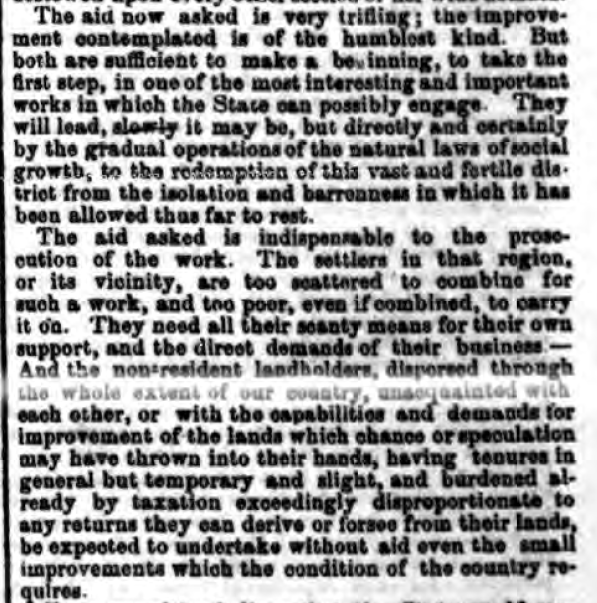 But, theirs was a deceptively impressive subsistence farm. 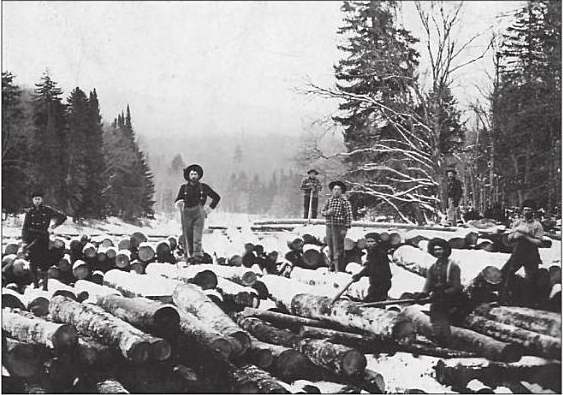 Though most Adirondack soils and the climate would not support expansive cultivation, their farm likely owed its success to two centuries of soil enrichment through burning and cultivating of root crops by Native Indians for their seasonal hunting parties. Emmons’ experience on Indian Point affected his overall vision for the region. Fortunately for us, his connection to Indian Point did not alter the lake’s name. Had Emmons chosen to re-name the lake, we might know it today by the aboriginal name recorded in his report, Lake Fobullangamuck. 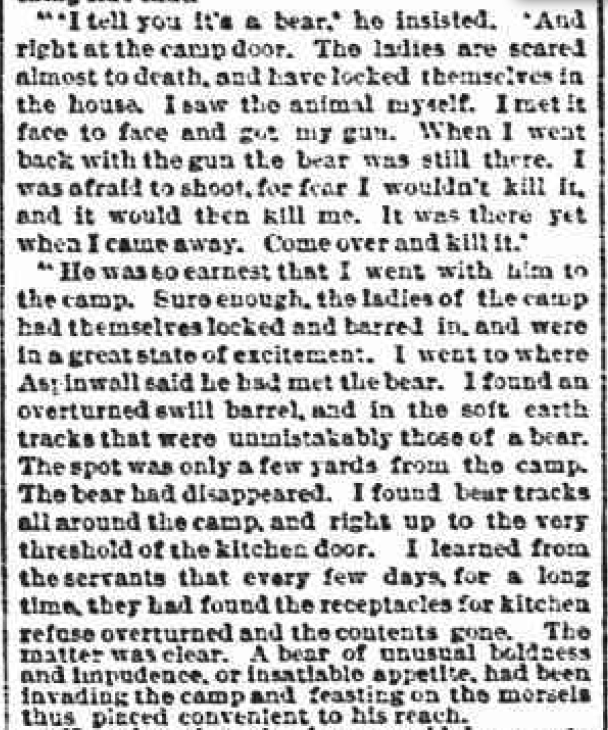 We have had our share of bear stories at the little red cabin on the tip of Birch Point. As a young boy I remember the night my brother, my father and I were sleeping in the lean-to, solely enclosed behind window screens and a screen door. In the middle of the night, I was awakened by the rustling of my father going out to fertilize the tree roots around the left side of the lean-to (I guess he just didn’t feel like making the trek to the outhouse down the path away from camp). Just as he disappeared around the corner of the lean-to, I noticed a big dark shadow off the right side of the lean-to, halfway between the little red cabin and our lean-to. As my eyes adjusted I could clearly see the slow lumbering movement of a black bear. 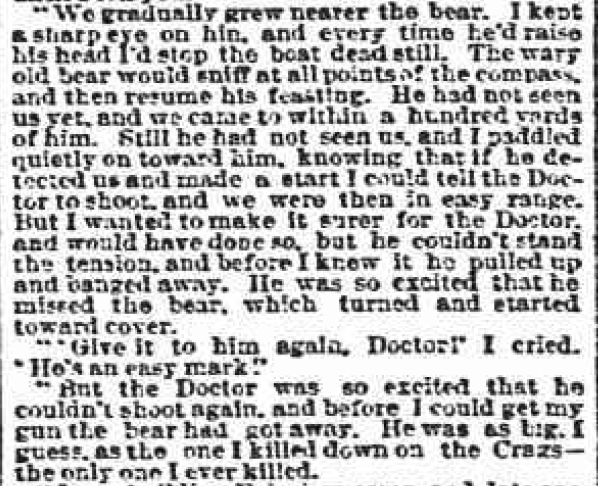 I called for my father and he rushed back and made for the door of the lean-to just before the bear reached the same spot. As we sat inside, we thought ourselves fortunate that this bear had no interest in us because the screens would have slowed him little if he wished to enter the lean-to. 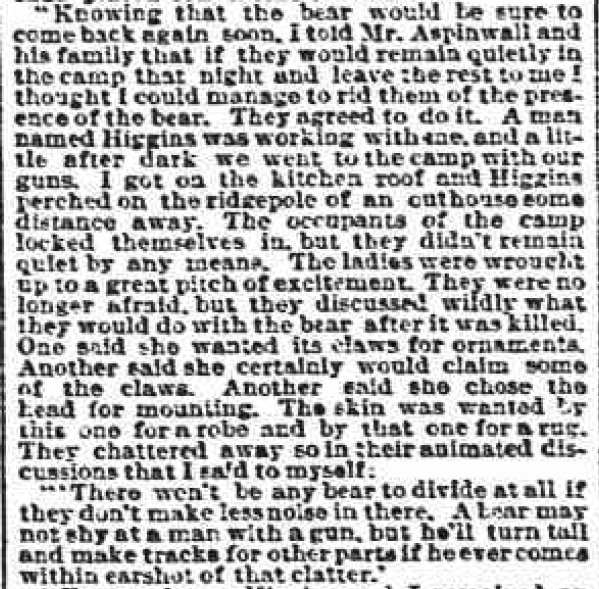 Sometime in the 1990s was the last time we know bears visited the end of Birch Point. 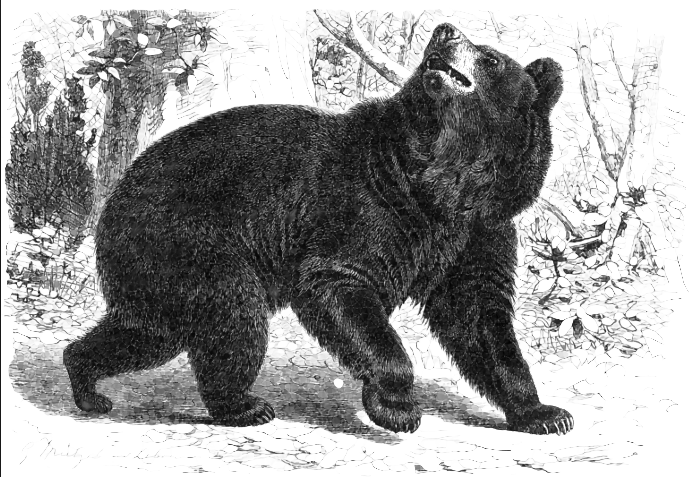 A mother and two cubs broke through the front door of the red cabin, tipped over the refrigerator and knocked the stove pipe off the cast iron pot belly wood stove, spraying soot and ash over everything. To make things worse, they somehow blocked their own escape and were forced to exit the cabin through the back window and in the process pulled the window, jam and all, right out of the wall. Fortunately, no one was home at the time but my cousins found the cabin in such a state when they arrived. 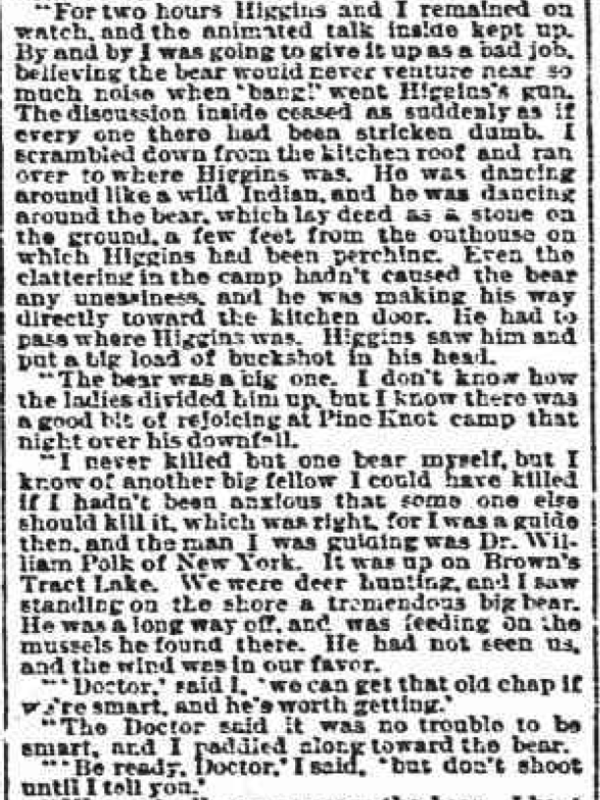 Obviously such interactions between humans and black bears have been happening for centuries and here is such a story published in The Sun newspaper of New York City. 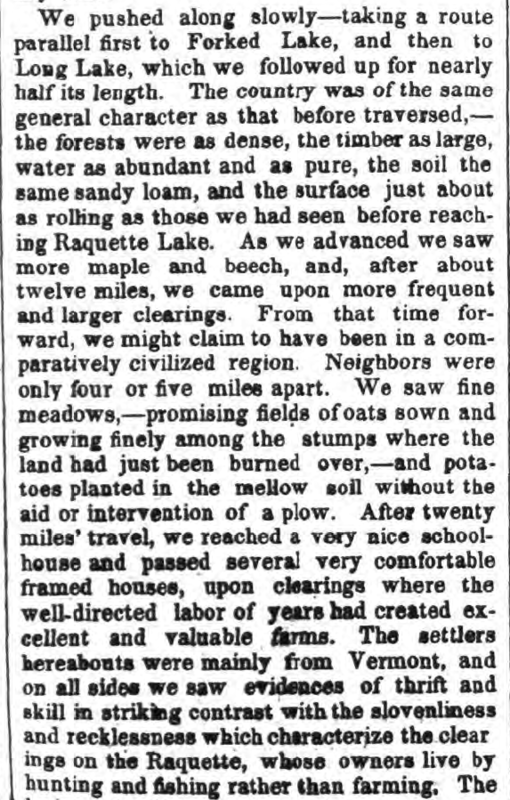 The northern shore of Indian Point is on North Bay, but this article is from 1900. 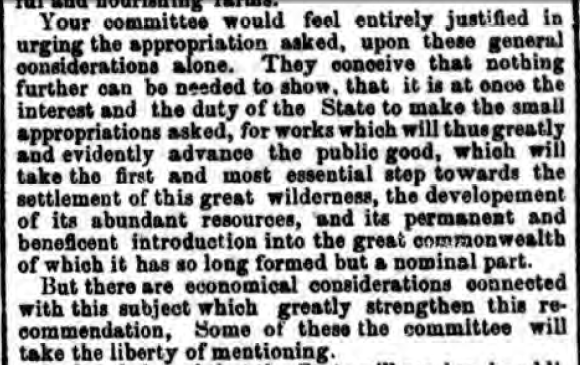 Had George Hornell Thacher offered our land for a State Forestry Camp as early as 1900? The 1900 Lumbering Map of Township 40 created by the same H. S. Meekham hangs on our living room wall. The location of the campsite is clearly marked as “Forester’s Point”, east of what today is called Quaker Beach. The four-week Forest Camp is one of the earliest examples of a career exploration program for high school youth as well as an adult learning vacation designed to build a political constituency that would advocate for forest conservation. This innovative camp was held on our family’s property in 1915 and 1916, a successful endeavor that was ended by the onset of World War I. Alas, just like the original Thacher cabin of the 1880s, neither detailed descriptions nor photos of these two August Forest Camps appear to have survived.